The term deformation is, like several other structural geology terms, used in different ways by different people and under different circumstances. In most cases, particularly in the ﬁeld, the term refers to the distortion (strain) that is expressed in a (deformed) rock. This is also what the word literally means: a change in form or shape. However, rock masses can be translated or rotated as rigid units during deformation, without any internal change in shape. For instance, fault blocks can move during deformation without accumulating any internal distortion. Many structural geologists want to include such rigid displacements in the term deformation, and we refer to them as rigid body deformation, as opposed to non-rigid body deformation (strain or distortion). Deformation is the transformation from an initial to a ﬁnal geometry by means of rigid body translation, rigid body rotation, strain (distortion) and/or volume change. Fig. 1. Displacement ﬁeld and particle paths for rigid translation and rotation, and strain resulting from simple shear, subsimple shear and pure shear. Particle paths trace the actual motion of individual particles in the deforming rock, while displacement vectors simply connect the initial and ﬁnal positions. Hence, displacement vectors can be constructed from particle paths, but not the other way around. It is useful to think of a rock or rock unit in terms of a continuum of particles. 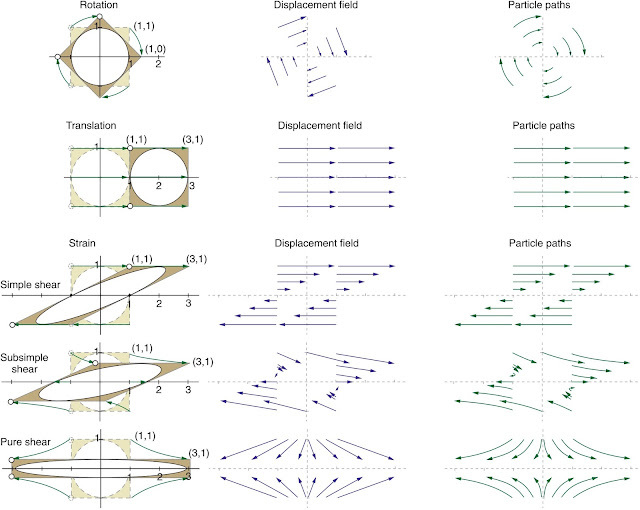 Deformation relates the positions of particles before and after the deformation history, and the positions of points before and after deformation can be connected with vectors. These vectors are called displacement vectors, and a ﬁeld of such vectors is referred to as the displacement ﬁeld. Displacement vectors, such as those displayed in the central column of Fig. 1, do not tell us how the particles moved during the deformation history they merely link the undeformed and deformed states. 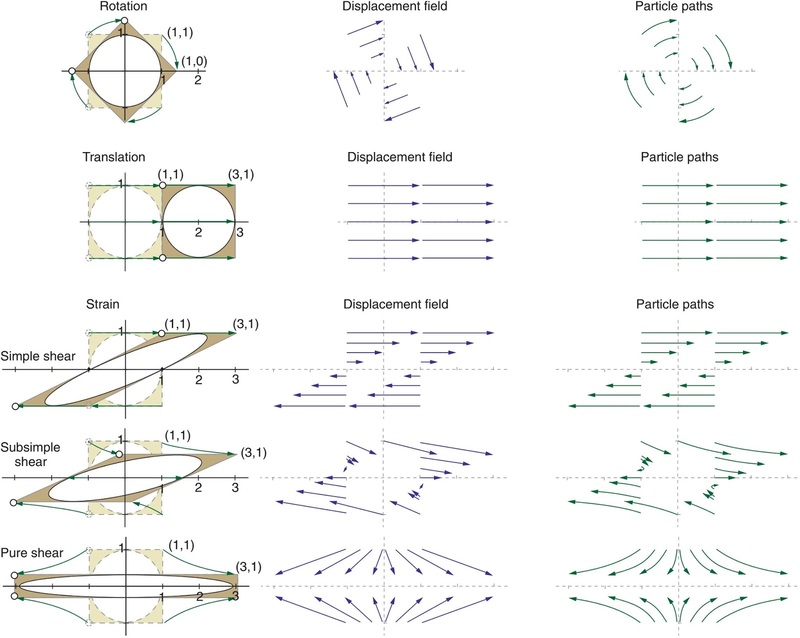 The actual path that each particle follows during the deformation history is referred to as a particle path, and for the deformations shown in Fig. 1 the paths are shown in the right column (green arrows). When speciﬁcally referring to the progressive changes that take place during deformation, terms such as deformation history or progressive deformation should be used. Fig. 2. (a) The total deformation of an object (square with an internal circle). Arrows in (a) are displacement vectors connecting initial and ﬁnal particle positions. Arrows in (b)–(e) are particle paths. (b, c) Translation and rotation components of the deformation shown in (a). (d) The strain component. A new coordinate system (x, y) is introduced (d). This internal system eliminates the translation and rotation (b, c) and makes it easier to reveal the strain component, which is here produced by a simple shear (e). The displacement ﬁeld can be decomposed into various components, depending on the purpose of the decomposition. The classic way of decomposing it is by separating rigid body deformation in the form of rigid translation and rotation from change in shape and volume. In Fig. 2 the translation component is shown in (b), the rotation component in (c) and the rest (the strain) in (d). Let us have a closer look at these expressions. Fig. 3. 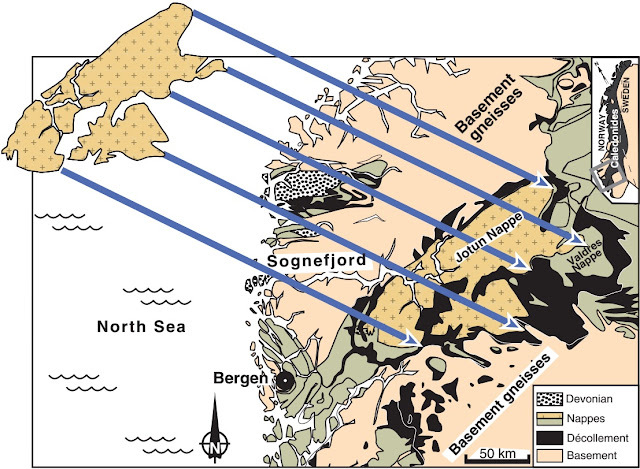 The Jotun Nappe in the Scandinavian Caledonides seems to have been transported more than 300 km to the southeast, based on restoration and the orientation of lineations. The displacement vectors are indicated, but the amount of rigid rotation around the vertical axis is unknown. The amount of strain is generally concentrated to the base. Translation moves every particle in the rock in the same direction and the same distance, and its displacement ﬁeld consists of parallel vectors of equal length. Translations can be considerable, for instance where thrust nappes (detached slices of rocks) have been transported several tens or hundreds of kilometres. The Jotun Nappe (Fig. 3) is an example from the Scandinavian Caledonides. In this case most of the deformation is rigid translation. 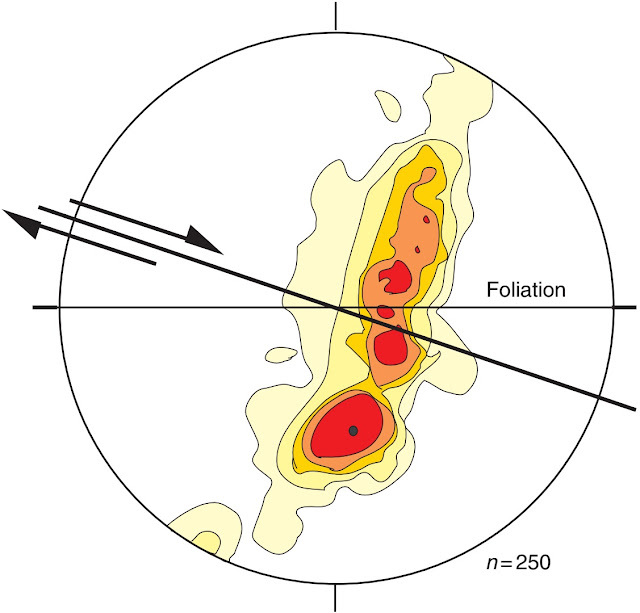 We do not know the exact orientation of this nappe prior to the onset of deformation, so we cannot estimate the rigid rotation (see below), but ﬁeld observations reveal that the change in shape, or strain, is largely conﬁned to the lower parts. The total deformation thus consists of a huge translation component, an unknown but possibly small rigid rotation component and a strain component localised to the base of the nappe. On a smaller scale, rock components (mineral grains, layers or fault blocks) may be translated along slip planes or planar faults without any internal change in shape. Rotation is here taken to mean rigid rotation of the entire deformed rock volume that is being studied. It should not be confused with the rotation of the (imaginary) axes of the strain ellipse during progressive deformation. Rigid rotation involves a uniform physical rotation of a rock volume (such as a shear zone) relative to an external coordinate system. Large-scale rotations of a major thrust nappe or entire tectonic plate typically occur about vertical axes. Fault blocks in extensional settings, on the other hand, may rotate around horizontal axes, and small-scale rotations may occur about any axis. Any change in shape, with or without change in volume, is referred to as strain, and it implies that particles in a rock have changed positions relative to each other. A rock volume can be transported (translated) and rotated rigidly in any way and sequence, but we will never be able to tell just from looking at the rock itself. All we can see in the ﬁeld or in samples is strain, and perhaps the way that strain has accumulated. Consider your lunch bag. You can bring it to school or work, which involves a lot of rotation and translation, but you cannot see this deformation directly. It could be that your lunch bag has been squeezed on your way to school – you can tell by comparing it with what it looked like before you left home. If someone else prepared your lunch and put it in your bag, you would use your knowledge of how a lunch bag should be shaped to estimate the strain (change in shape) involved. The last point is very relevant, because with very few exceptions, we have not seen the deformed rock in its undeformed state. We then have to use our knowledge of what such rocks typically look like when unstrained. For example, if we ﬁnd strained ooliths or reduction spots in the rock, we may expect them to have been spherical (circular in cross-section) in the undeformed state. Even if the shape of a rock volume is unchanged, it may have shrunk or expanded. We therefore have to add volume change (area change in two dimensions) for a complete description of deformation. Volume change, also referred to as dilation, is commonly considered to be a special type of strain, called volumetric strain. However, it is useful to keep this type of deformation separate if possible. For studies of deformation, a reference or coordinate system must be chosen. Standing on a dock watching a big ship entering or departing can give the impression that the dock, not the ship, is moving. Unconsciously, the reference system gets ﬁxed to the ship, and the rest of the world moves by translation relative to the ship. While this is fascinating, it is not a very useful choice of reference. Rock deformation must also be considered in the frame of some reference coordinate system, and it must be chosen with care to keep the level of complexity down. We always need a reference frame when dealing with displacements and kinematics. It is often useful to orient the coordinate system along important geologic structures. This could be the base of a thrust nappe, a plate boundary or a local shear zone. In many cases we want to eliminate translation and rigid rotation. In the case of shear zones we normally place two axes parallel to the shear zone with the third being perpendicular to the zone. If we are interested in the deformation in the shear zone as a whole, the origin could be ﬁxed to the margin of the zone. If we are interested in what is going on around any given particle in the zone we can “glue” the origin to a particle within the zone (still parallel/perpendicular to the shear zone boundaries). In both cases translation and rigid rotation of the shear zone are eliminated, because the coordinate system rotates and translates along with the shear zone. There is nothing wrong with a coordinate system that is oblique to the shear zone boundaries, but visually and mathematically it makes things more complicated. Deformation is the difference between the deformed and undeformed states. It tells us nothing about what actually happened during the deformation history. A given strain may have accumulated in an inﬁnite number of ways. Imagine a tired student (or professor for that matter) who falls asleep in a boat while ﬁshing on the sea or a lake. The student knows where he or she was when falling asleep, and soon ﬁgures out the new location when waking up,but the exact path that currents and winds have taken the boat is unknown. The student only knows the position of the boat before and after the nap, and can evaluate the strain (change in shape) of the boat (hopefully zero). One can map the deformation, but not the deformation history. Let us also consider particle ﬂow: Students walking from one lecture hall to another may follow inﬁnitely many paths (the different paths may take longer or shorter time, but deformation itself does not involve time). All the lecturer knows, busy between classes, is that the students have moved from one lecture hall to the other. Their history is unknown to the lecturer (although he or she may have some theories based on cups of hot coffee etc.). In a similar way, rock particles may move along a variety of paths from the undeformed to the deformed state. One difference between rock particles and individual students is of course that students are free to move on an individual basis, while rock particles, such as mineral grains in a rock, are “glued” to one another in a solid continuum and cannot operate freely. Where the deformation applied to a rock volume is identical throughout that volume, the deformation is homogeneous. Rigid rotation and translation by deﬁnition are homogenous, so it is always strain and volume or area change that can be heterogeneous. Thus homogeneous deformation and homogeneous strain are equivalent expressions. Fig. 4. Homogeneous deformations of a rock with brachiopods, reduction spots, ammonites and dikes. Two different deformations are shown (pure and simple shear). Note that the brachiopods that are differently oriented before deformation obtain different shapes. For homogeneous deformation, originally straight and parallel lines will be straight and parallel also after the deformation, as demonstrated in Fig. 4. Further, the strain and volume/area change will be constant throughout the volume of rock under consideration. If not, then the deformation is heterogeneous (inhomogeneous). This means that two objects with identical initial shape and orientation will end up having identical shape and orientation after the deformation. Note, however, that the initial shape and orientation in general will differ from the ﬁnal shape and orientation. If two objects have identical shapes but different orientations before deformation, then they will generally have different shapes after deformation even if the deformation is homogeneous. An example is the deformed brachiopods in Fig. 4. The difference reﬂects the strain imposed on the rock. Homogeneous deformation: Straight lines remain straight, parallel lines remain parallel, and identically shaped and oriented objects will also be identically shaped and oriented after the deformation. A circle will be converted into an ellipse during homogeneous deformation, where the ellipticity (ratio between the long and short axes of the ellipse) will depend on the type and intensity of the deformation. Mathematically, this is identical to saying that homogeneous deformation is a linear transformation. Homogeneous deformation can therefore be described by a set of ﬁrst-order equations (three in three dimensions) or, more simply, by a transformation matrix referred to as the deformation matrix. Fig. 5. A regular grid in undeformed and deformed state. The overall strain is heterogeneous, so that some of the straight lines have become curved. However, in a restricted portion of the grid, the strain is homogeneous. In this case the strain is also homogeneous at the scale of a grid cell. A deformation that is homogeneous on one scale may be considered heterogeneous on a different scale. Fig. 6. Discrete or discontinuous deformation can be approximated as continuous and even homogeneous in some cases. In this sense the concept of strain can also be applied to brittle deformation (brittle strain). The success of doing so depends on the scale of observation. A classic example is the increase in strain typically seen from the margin toward the centre of a shear zone. The strain is heterogeneous on this scale, but can be subdivided into thinner elements or zones in which strain is approximately homogeneous. Another example is shown in Fig. 6, where a rock volume is penetrated by faults. On a large scale, the deformation may be considered homogeneous because the discontinuities represented by the faults are relatively small. On a smaller scale, however, those discontinuities become more apparent, and the deformation must be considered heterogeneous. Fig. 1. Stereographic projection of an ESE-dipping plane. Stereographic projection is about representing planar and linear features in a two-dimensional diagram. The orientation of a plane is represented by imagining the plane to pass through the centre of a sphere (Fig. 1a). The line of intersection between the plane and the sphere will then represent a circle, and this circle is formally known as a great circle. 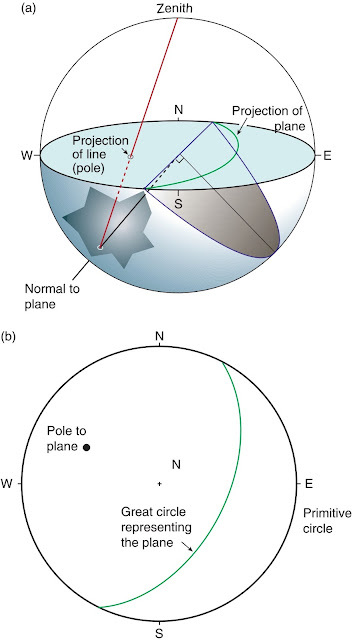 Except for the ﬁeld of crystallography, where upper-hemisphere projection is used, geologists use the lower part of the hemisphere for stereographic projections, as shown in Fig. 1b. We would like to project the plane onto the horizontal plane that runs through the centre of the sphere. Hence, this plane will be our projection plane, and it will intersect the sphere along a horizontal circle called the primitive circle. To perform the projection we connect points on the lower half of our great circle to the topmost point of the sphere or the zenith (red lines in Fig. 1c). A circleshaped projection (part of a circle) then occurs on our horizontal projection plane, and this projection is a stereographic projection of the plane. If the plane is horizontal it will coincide with the primitive circle, and if vertical it will be represented by a straight line. Stereographic projections of planes are formally called cyclographic traces, but are almost always referred to as great circles because of their close connection with great circles as deﬁned above. Once we understand how the stereographic projection of a plane is done it also becomes obvious how lines are projected, because a line is just a subset of a plane. Lines thus project as points, while planes project as great circles. A great circle (as any circle) can be considered to consist of points, each of which represents a line withinthe plane. Hence, a line contained in a plane, such as a slickenline or mineral lineation, will therefore appear as a point on the great circle corresponding to that plane. Fig. 2. Stereographic projection of a line, in this case the normal or pole to a plane. In Fig. 2 we have also projected the line that is normal to a given plane, represented by the pole to the plane. The projection is found by orienting the line through the center and connecting its intersection with the lower hemisphere with the zenith (red line in Fig. 2a). The intersection of this (red) line with the projection plane is the pole to the plane. Hence, planes can be represented in two ways, as great circle projections and as poles. Note that horizontal lines plot along the primitive circle (completely horizontal poles are represented by two opposite symbols) and vertical lines plot in the centre. Fig. 3. The stereonet. To compare this with longitude and latitudes of our planet, remember that the north–south axis is horizontal in the stereonet, and vertical in common views of the Earth. For stereographic projections to be practical, we have to establish a grid of known surfaces for reference. We have already equipped the primitive circle with geographical directions (north, south, east and west), and we can compare the sphere with a globe with longitudes and latitudes. In three dimensions this is illustrated in Fig. 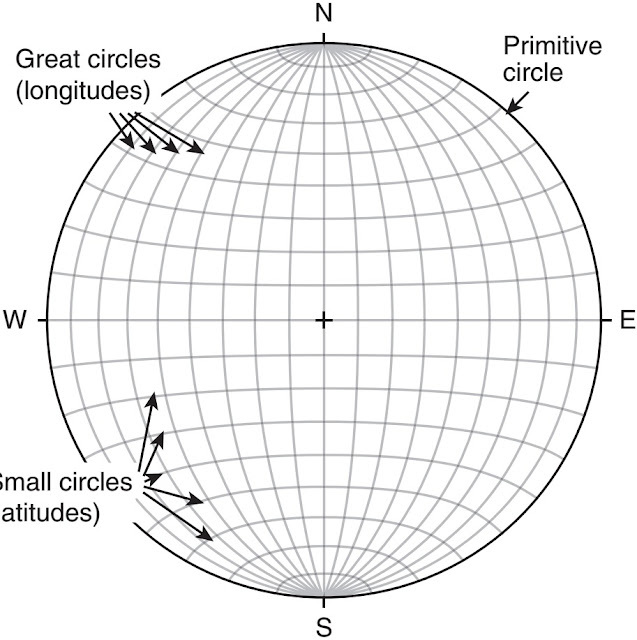 3, looking from the south pole toward the north pole: longitudes and latitudes are the lines of intersection between great circles (the original meaning) and so-called small circles. If we now project the small and great circles onto the horizontal projection plane, typically for every 2 and 10 degree interval, we will get what is called a stereographic net or stereonet. The longitudes are planes that intersect in a common line (the N–S line), and thus appear as great circles in the stereonet. 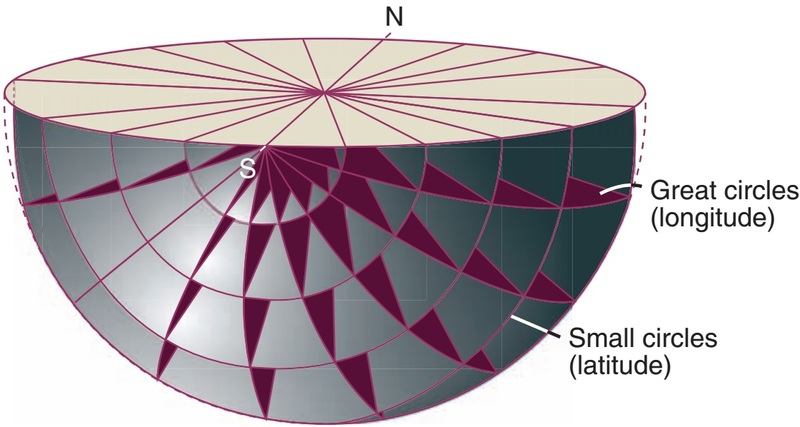 The projections of the latitudes, which are not planes but cones coaxial with the N–S line, are usually referred to as small circles (also their projections onto the stereonet). The net that emerges from the particular projection described above is called the Wulff net. Fig. 4. The equal area net. Fig. 5. The equal area projection. A plane is projected onto the projection plane, which in this case has been made tangential to the lower pole of the sphere. The projection is illustrated in 3-D (a) and along a proﬁle through C and A (b). Fig. 6. Two hundred and fifty quartz c-axes measured on the U-stage and plotted in the stereonet. An asymmetrical pattern with respect to the foliation (trending E–W in the plot), such as the one shown here, indicates the sense of shear. The Wulff net makes it possible to work with angular relations (it preserves angles between planes across the net), which can be useful in some cases, for instance for crystallographic purposes. However, for most structural purposes it is more useful to preserve area, so that the densities of projections in one part of the plot can be directly compared to those of another. The method of plotting is the same, but because the projection is not stereographic but equal area (Fig. 4), the positions of planes and lines in the plot become somewhat different. The net is called a Schmidt net or simply an equal area net (Fig. 5 shows the equal area projection). Multiple data plotted in an equal area net can be contoured with respect to density, which can be useful when evaluating concentrations of structural data around certain geographic directions. Contouring is typically done for crystallographic axes such as quartz c-axes (Fig. 6), and the contour values exhibit the number of points as the percentage within a given 1% area of the stereonet. Contouring is easily done by means of one of the many computer programs available for personal computers. Planes can be represented in a stereonet in two different ways: by means of great circles or poles (Fig 2). Fig. 5 gives a demonstration of how to plot both by hand, and we will start with a great circle representation. Fig. 7. Plotting the plane N 030 E, 30 NE in the stereonet (equal area projection). A plane striking 030 (or N 30 E) and dipping 30 to the SE is plotted as an example. Tracing paper is placed over a pre-made net (an equal area net was chosen), and the centers are attached by means of a thumb tack. The primitive circle and north (N) are marked on the transparent overlay. We then mark off the strike value of our plane, which is 030 (Fig. 7a), and then rotate the overlay so that this mark occurs above the N direction of the underlying stereo plot (Fig. 7b). For our example, this involves rotating the overlay 30 anticlockwise. We then count the dip value from the primitive circle inwards, and trace the great circle that it falls on (Fig. 7b). When N on the tracing paper is rotated back to its original orientation (Fig. 7c) we have a great circle that represents our plane. The shallower its dip, the closer it comes to the primitive circle, which itself represents a horizontal plane. The procedure is quite similar if we want to plot poles. All we do differently is to count the dip from the center of the plot in the direction opposite to that of the dip, which in our example is to the left. When done correctly, there will be 90 between the great circle and the pole of the same plane (see Fig. 7b). The pole thus falls on the opposite side of the diagram from that of the corresponding great circle. Poles are generally preferred in structural analyses that involve large amounts of orientation data, and particularly if grouping of structural orientations is an issue (which commonly is the case). Fig. 8. Plotting the line plunging 40 degrees towards N 030 E in the stereonet (equal area projection). Plotting a line orientation is similar (but different) to plotting a plane orientation. For example, a line plunging 40 degrees toward 030 (NE) is considered. As for the plane, we mark off the trend (030) (Fig. 8a), rotate the overlay either 30 degrees anticlockwise, as for the plane (Fig. 8b), or until it reaches the E direction (a clockwise rotation of 60 degrees for our example). Now count the plunge value along the straight line toward the center, starting at the primitive circle, and mark off the pole (Fig. 8b). Back-rotate the overlay, and the task is completed (Fig. 8c). Fig. 9. A constructed, but realistic, situation where various structural elements in a deformed rock sequence are represented in stereonets. Plotting bedding orientations reveals the b-axis (local orientation of the hinge line). The angle between the fracture sets can be found by counting degrees along the great circle that ﬁts both data sets. Fault data are plotted separately, showing the fault plane as a great circle and lineations as dots on that great circle. When doing fault analyses it is useful to plot both the slip plane and its lineation(s) in the same plot. In this case the lineation will lie on the great circle that is representing the slip plane. The angle between the horizontal direction and the lineation is called the rake or pitch, and is plotted by rotating the great circle of the plane to a N–S orientation and then counting the number of degrees from the horizontal (N or S), i.e. the pitch value measured in the ﬁeld (Fig. 9). Users of the right hand rule will always measure the pitch clockwise from the strike value, so that the angle could be up to 180 degrees . The right-hand rule has been used in Fig. 9. Others measure the acute angle and count from the appropriate strike direction, in which case the pitch will not exceed 90 degrees. If two or more lines are known to lie in a common plane, the plane is found by plotting the lines in a net. The lines are then rotated until they fall on a common great circle, which represents the plane we are looking for. The line of intersection between two planes is perhaps most easily seen by plotting the great circles of the two planes, in which case the line of intersection is represented by the point where the two great circles cross. When plotting poles to planes, the line of intersection is the pole to the great circle that ﬁts (contains) the two poles. The angle between two planes is found by plotting the planes as poles and then rotating the tracing paper until the two points fall on a great circle. The angle between the planes is then found by counting the degrees between the two points on the great circle (Fig. 9, where the angle of two sets of fractures is considered). The angle between two lines is found in a similar manner, where the two lines are ﬁtted to a great circle (the plane containing both lines) and the distance between them (in degrees) represents the angle (Fig. 9, lineations). Finding the orientation of a planar structure from observations of apparent dips can sometimes be useful. If two or more apparent dips are measured on two arbitrarily oriented planes, and each of those two planes is represented by a great circle and a point representing the apparent dip (measured at the outcrop), then the great circle that best ﬁts the points represents the plane we want to ﬁnd. 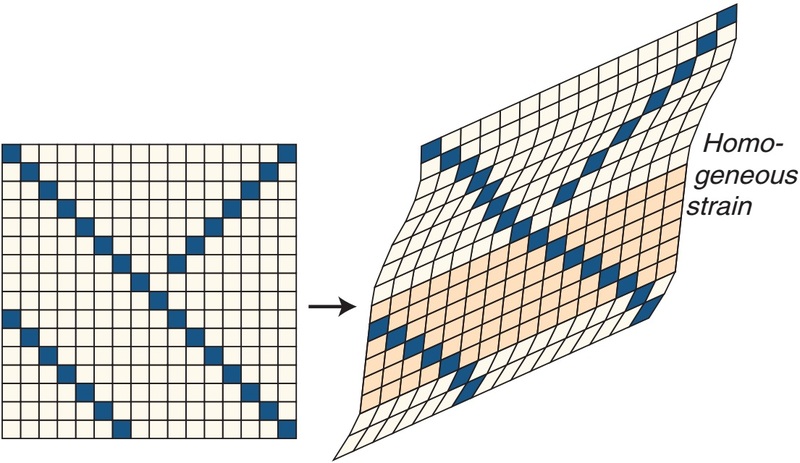 An inverse problem would be to determine apparent dips of a known planar fabric or structure as exposed on selected surfaces. We then plot the planar fabric as a great circle, and the apparent dip will be deﬁned by the point of intersection between the planar fabric and the surface of interest. Rotation of planar and linear structures can be done by moving them along a great circle, the pole of which represents the rotation axis. Rotation about a horizontal axis is easy: just rotate the tracing paper so that the rotation axis falls along the N–S direction, and then rotate poles by counting degrees along the small circles. Rotating along an inclined axis is a bit more cumbersome. It involves rotating everything so that the axis of rotation becomes horizontal, then performing the rotation as above, and ﬁnally, back-rotating so that the axis of rotation achieves its original orientation. Fig. 10. The plots show the variations within each subarea, portrayed by means of poles, rose diagrams, and an arrow indicating the average orientation. The number of data within each subarea is indicated by “n”. Sometimes only the strike component of planes is measurable or of interest, in which case the data can be represented in the form of a rose diagram. A rose diagram is the principal circle subdivided into sectors, where the number of measurements recorded within each sector is represented by the length of the respective petal. This is a visually attractive way of representing the orientation of fractures and lineaments as they appear on the surface of the Earth, and can also be used to represent the trend distribution of linear structures (Fig. 10). All of these operations and more can be done more quickly by means of stereographic plotting programs, such as the one generously made available to the structural community by Richard Allmendinger (1998). However, understanding the underlying principles is the key to success when using such programs. Several plotting programs also have statistical add-ons that are quite useful. Many structural processes span thousands to millions of years, and most structural data describe the ﬁnal product of a long deformation history. The history itself can only be revealed through careful analysis of the data. When looking at a fold, it may not be obvious whether it formed by layer parallel shortening, shearing or passive bending. The same thing applies to a fault. What part of the fault formed ﬁrst? Did it form by linking of individual segments, or did it grow from a single point outward, and if so, was this point in the central part of the present fault surface? It may not always be easy to answer such questions, but the approach should always be to analyze the ﬁeld information and compare with experimental and/or numerical models. The analysis of the geometry of structures is referred to as geometric analysis. This includes the shape, geographic orientation, size and geometric relation between the main (ﬁrst-order) structure and related smaller-scale (second-order) structures. The last point emphasizes the fact that most structures are composite and appear in certain structural associations at various scales. Hence, various methods are needed to measure and describe structures and structural associations. Geometric analysis is the classic descriptive approach to structural geology that most secondary structural geologic analytical methods build on. Fig. 1. 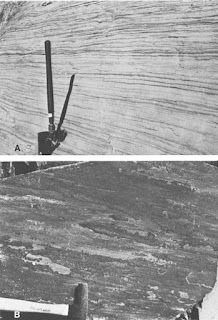 Deformation of the hanging wall above a listric fault. (a) Pure translation. (b–d) Antithetic, vertical and synthetic shear. Note the different hanging-wall geometries and the fact that the shear only affects the left part of the hanging wall. Fig. 2. Listric normal fault showing very irregular curvature in the sections perpendicular to the slip direction. These irregularities can be thought of as large grooves or corrugations along which the hanging wall can slide. Shape is the spatial description of open or closed surfaces such as folded layer interfaces or fault surfaces. The shape of folded layers may give information about the fold-forming process or the mechanical properties of the folded layer, while fault curvature may have implications for hanging-wall deformation (Figure 1) or could give information about the slip direction (Figure 2). Orientations of linear and planar structures are perhaps the most common type of structural data. Shapes and geometric features may be described by mathematical functions, for instance by use of vector functions. In most cases, however, natural surfaces are too irregular to be described accurately by simple vector functions, or it may be impossible to map faults or folded layers to the extent required for mathematical description. Nevertheless, it may be necessary to make geometric interpretations of partly exposed structures. Our data will always be incomplete at some level, and our minds tend to search for geometric models when analyzing geologic information. For example, when the Alps were mapped in great detail early in the twentieth century, their major fold structures were generally considered to be cylindrical, which means that fold axes were considered to be straight lines. This model made it possible to project folds onto cross-sections, and impressive sections or geometric models were created. At a later stage it became clear that the folds were in fact non-cylindrical, with curved hinge lines, requiring modiﬁcation of earlier models. Fig 3, Synthetic structural data sets showing different degree of homogeneity. (a) Synthetic homogeneous set of strike and dip measurements. 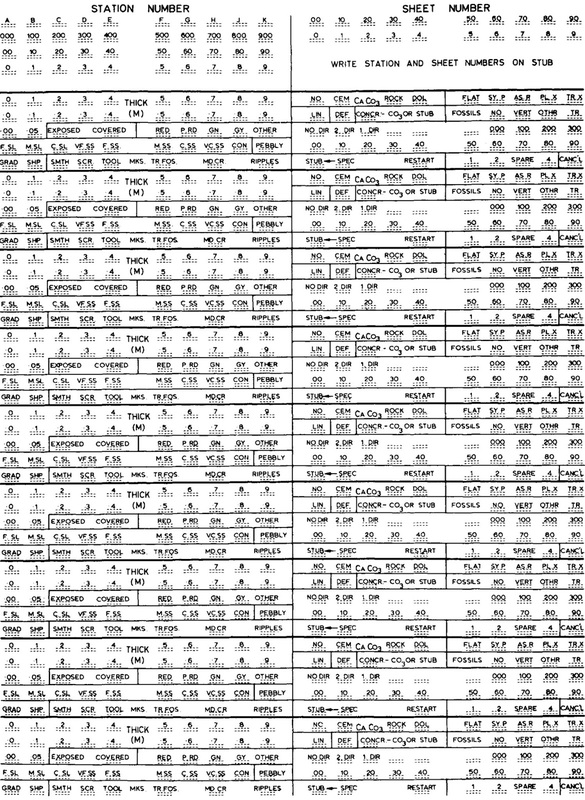 (b) Systematic variation in layer orientation measurements. (c) Homogeneous subareas due to kink or chevron folding. (d, e) Systematic fracture systems. Note how the systematics is reﬂected in the stereonets. Fig. 4. Lineation data from subareas deﬁned in the previous ﬁgure. 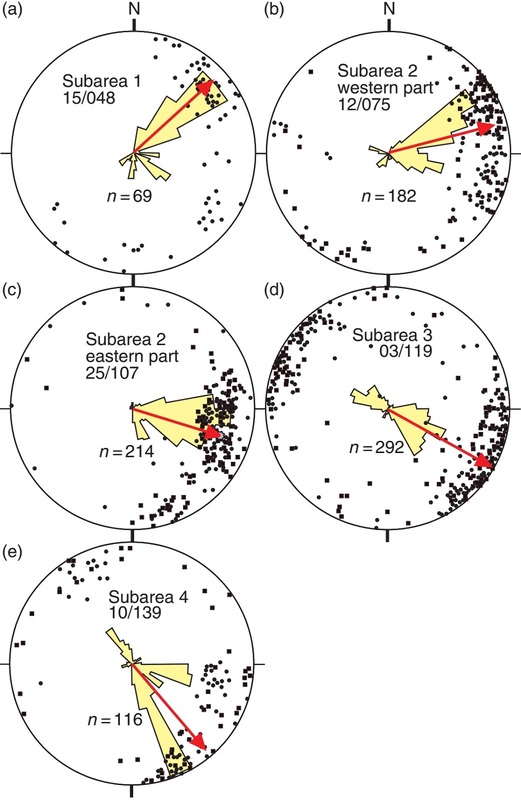 The plots show the variations within each subarea, portrayed by means of poles, rose diagrams, and an arrow indicating the average orientation. The number of data within each subarea is indicated by “n”. In geometric analysis it is very useful to represent orientation data (e.g. Fig. 3 and 4) by means of stereographic projection. Stereographic projection is used to show or interpret both the orientation and geometry of structures. The method is quick and efﬁcient, and the most widely used tool for presenting and interpreting spatial data. In general, geometry may be presented in the form of maps, proﬁles, stereographic projections, rose diagrams or threedimensional models based on observations made in the ﬁeld, from geophysical data, satellite information or laser scanning equipment. Any serious structural geologist needs to be familiar with the stereographic projection method. Geometric description and analysis may form the basis for strain quantiﬁcation or strain analysis. Such quantiﬁcation is useful in many contexts, e.g. in the restoration of geologic sections through deformed regions. Strain analysis commonly involves ﬁnite strain analysis, which concerns changes in shape from the initial state to the very end result of the deformation. Structural geologists are also concerned with the deformation history, which can be explored by incremental strain analysis. In this case only a portion of the deformation history is considered, and a sequence of increments describes the deformation history. By deﬁnition, strain applies to ductile deformation, i.e. 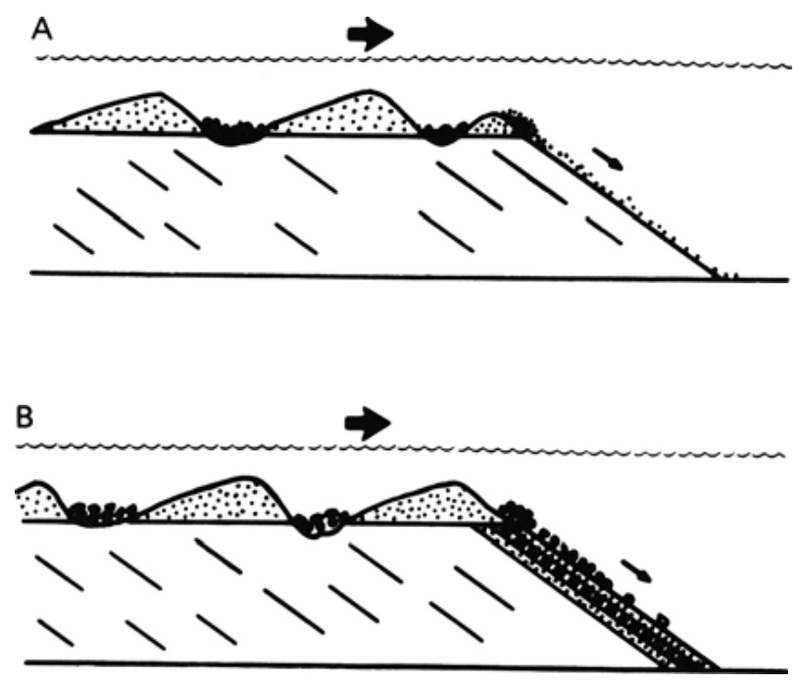 deformation where originally continuous structures such as bedding or dikes remain continuous after the deformation. Ductile deformation occurs when rocks ﬂow (without fracture) under the inﬂuence of stress. The opposite, brittle deformation, occurs when rocks break or fracture. However, modern geologists do not restrict the use of strain to ductile deformation. In cases where fractures occur in a high number and on a scale that is signiﬁcantly smaller than the discontinuity each of them causes, the discontinuities are overlooked and the term brittle strain is used. It is a simpliﬁcation that allows us to perform strain analysis on brittle structures such as fault populations. Fig. 5. Abrasive marks (slickenlines) on fault slip surfaces give local kinematic information. Seismically active fault in the Gulf of Corinth. Fig. 6. An example of how geometric analysis can lead to a kinematic model, in this case of sense of movement on a fault. (a) A fault where stratigraphy cannot be correlated across the fault. (b, c) Relative movement can be determined if layer rotation can be observed close to the fault. The geometry shown in (b) supports a normal fault movement, while (c) illustrates the geometry expected along a reverse fault. Geometric description also forms the foundation of kinematic analysis, which concern show rock particles have moved during deformation (the Greek word kinema means movement). Striations on fault surfaces (Figure 5) and deﬂection of layering along faults and in shear zones are among the structures that are useful in kinematic analysis. To illustrate the connection between kinematic analysis and geometric analysis, consider the fault depicted in Figure 6a. We cannot correlate the layers from one side to the other, and we do not know whether this is a normal or reverse fault. However, if we ﬁnd a deﬂection of the layering along the fault, we can use that geometry to interpret the sense of movement on the fault. Figure 6 b, c shows the different geometries that we would expect for normal and reverse movements. In other words, a ﬁeld based kinematic analysis relies on geometric analysis. Dynamics is the study of forces that cause motion of particles (kinematics). Forces acting on a body generate stress, and if the level of stress becomes high enough, rocks start to move. Hence dynamics in the context of structural geology is about the interplay between stress and kinematics. When some particles start to move relative to other particles we get deformation, and we may be able to see changes in shape and the formation of new structures. Dynamic analysis explores the stresses or forces that cause structures to form and strain to accumulate. In most cases dynamic analysis seeks to reconstruct the orientation and magnitude of the stress ﬁeld by studying a set of structures, typically faults and fractures. Returning to the example shown in Fig. 6, it maybe assumed that a strong force or stress acted in the vertical direction in case (b), and in the horizontal direction in case (c). 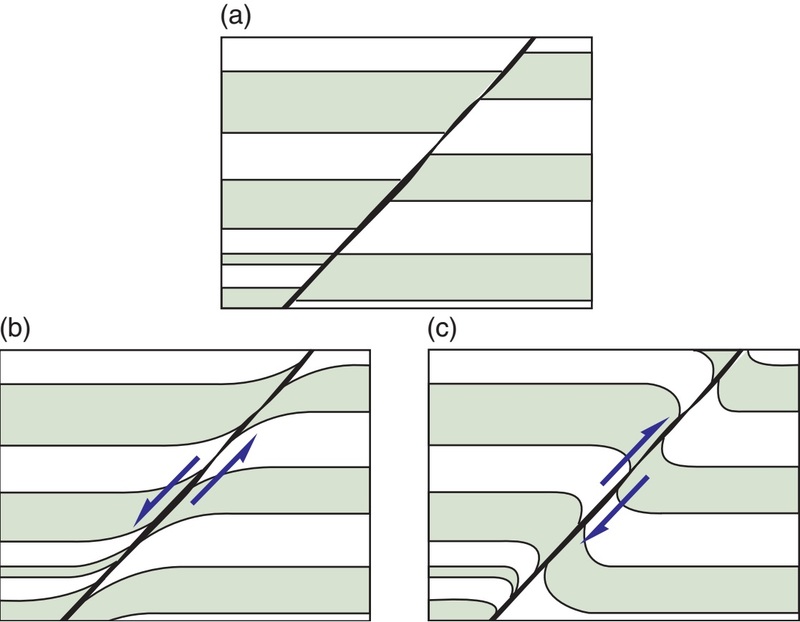 In practice, the exact orientations of forces and stress axes are difﬁcult or impossible to estimate from a single fault structure, but can be estimated for populations of faults forming in a uniform stress ﬁeld. Applying stress to syrup gives a different result than stressing a cold chocolate bar: the syrup will ﬂow, while the chocolate bar will break. We are still dealing with dynamic analyses, but the part of dynamics related to the ﬂow of rocks is referred to as rheologic analysis. Similarly, the study of how rocks (or sugar) break or fracture is the ﬁeld of mechanical analysis. In general, rocks ﬂow when they are warm enough, which usually means when they are buried deep enough.“Deep enough” means little more than surface temperatures for salt, around 300 C for a quartz-rich rock, perhaps closer to 550 C for a feldspathic rock, and even more for olivine-rich rocks. Pressure also plays an important role, as does water content and strain rate. It is important to realize that different rocks behave differently under any given conditions, but also that the same rock reacts differently to stress under different physical conditions. Rheological testing is done in the laboratory in order to understand how different rocks ﬂow in the lithosphere. Fig 7. Scanning electron microphotograph of a millimeter-thin zone of grain deformation (deformation band) in the Entrada Sandstone near Goblin Valley State Park, Utah. Tectonic analysis involves dynamic, kinematic and geometric analysis at the scale of a basin or orogenic belt. This kind of analysis may therefore involve additional elements of sedimentology, paleontology, petrology, geophysics and other subdisciplines of geoscience. Structural geologists involved in tectonic analysis are sometimes referred to as tectonicists. On the opposite end of the scale range, some structural geologists analyze the structures and textures that can only be studied through the microscope. This is the study of how deformation occurs between and within individual mineral grains and is referred to as microstructural analysis or microtectonics. Both the optical microscope and the scanning electron microscope (SEM) (Fig. 7.) are useful tools in microstructural analysis. "A geologic structure is a geometric conﬁguration of rocks, and structural geology deals with the geometry, distribution and formation of structures". It should be added that structural geology only deals with structures created during rock deformation, not with primary structures formed by sedimentary or magmatic processes. However, deformation structures can form through the modiﬁcation of primary structures, such as folding of bedding in a sedimentary rock. "Tectonics is connected with external and often regional processes that generate a characteristic set of structures in an area or a region". By external we mean external to the rock volume that we study. External processes or causes are in many cases plate motions, but can also be such things as forceful intrusion of magma, gravity-driven salt or mud diapirs, ﬂowing glaciers and meteor impacts. Each of these “causes” can create characteristic structures that deﬁne a tectonic style, and the related tectonics can be given special names. Plate tectonics is the large-scale part of tectonics that directly involves the movement and interaction of lithospheric plates. Within the realm of plate tectonics, expressions such as subduction tectonics, collision tectonics and rift tectonics are applied for more speciﬁc purposes. Glaciotectonics is the deformation of sediments and bedrock (generally sedimentary rocks) at the toe of an advancing ice sheet. In this case it is the pushing of the ice that creates the deformation, particularly where the base of the glacier is cold (frozen to the substrate). Salt tectonics deals with the deformation caused by the (mostly) vertical movement of salt through its overburden. Both glaciotectonics and salt tectonics are primarily driven by gravity, although salt tectonics can also be closely related to plate tectonics. For example, tectonic strain can create fractures that enable salt to gravitationally penetrate its cover. The term gravity tectonics is generally restricted to the downward sliding of large portions of rocks and sediments, notably of continental margin deposits resting onweak salt or overpressured shale layers. Raft tectonics is a type of gravity tectonics occurring in such environments. 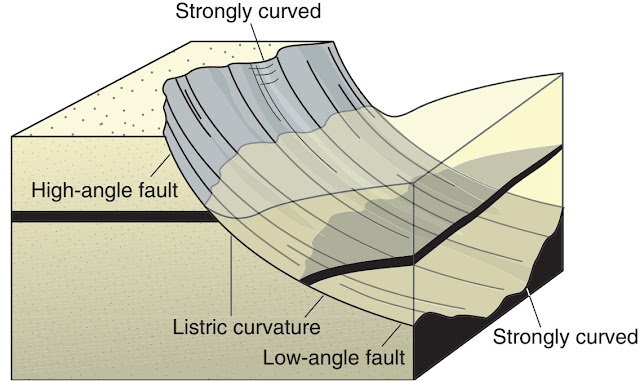 Smaller landslides and their structures are also considered examples of gravity tectonics by some, while others regard such surﬁcial processes as non-tectonic. Typical nontectonic deformation is the simple compaction of sediments and sedimentary rocks due to loading by younger sedimentary strata. Neotectonics is concerned with recent and ongoing crustal motions and the contemporaneous stress ﬁeld. Neotectonic structures are the surface expression of faults in the form of fault scarps, and important data sets stem from seismic information from earthquakes and changes in elevation of regions detected by repeated satellite measurements. At smaller scales, microtectonics describes microscale deformation and deformation structures visible under the microscope. Structural geology typically pertains to the observation, description and interpretation of structures that can be mapped in the ﬁeld. How do we recognize deformation or strain in a rock? “Strained” means that something primary or preexisting has been geometrically modiﬁed, be it cross stratiﬁcation, pebble shape, a primary magmatic texture or a preexisting deformation structure. Hence strain can be deﬁned as a change in length or shape, and recognizing strain and deformation structures actually requires solid knowledge of undeformed rocks and their primary structures. Being able to recognize tectonic deformation depends on our knowledge of primary structures. Fig. 1. Illustration of the close relationship between sedimentary facies, layer thickness variations and syndepositional faulting (growth fault) along the margin of a sedimentary basin. The resulting deformation structure also depends on the initial material and its texture and structure. Deforming sandstone, clay, limestone or granite results in signiﬁcantly different structures because they respond differently. Furthermore, there is often a close relationship between tectonics and the formation of rocks and their primary structures. Sedimentologists experience this as they study variations in thickness and grain size in the hanging wall (down-thrown side) of syndepositional faults. This is illustrated in Fig. 1, where the gradual rotation and subsidence of the down-faulted block gives space for thicker strata near the fault than farther away, resulting in wedge shaped strata and progressively steeper dips down section. There is also a facies variation, with the coarsest-grained deposits forming near the fault, which can be attributed to the fault-induced topography seen in Fig. 1. Fig. 2. Structural geology can be linked to processes and mechanisms other than plate stresses. This map and proﬁle from a granodioritic pluton southwest of Beijing, China, portray close connection between forceful intrusion of magma, strain and folds in the country rock. Black ellipses indicate strain. The strain (deformation) pattern within and around the pluton can be explained in terms of diapirism, where the intrusion ascends and squeezes and shears its outer part and the surrounding country rock to create space. Another close relationship between tectonics and rock forming processes is shown in Figure 2, where forceful rising and perhaps inﬂating of magma deforms the outer and oldest part of the pluton and its country rock. 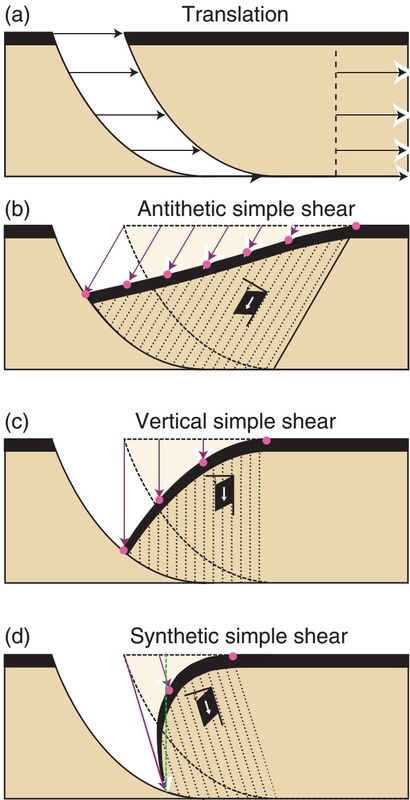 Forceful intrusion of magma into the crust is characterized by deformation near the margin of the pluton, manifested by folding and shearing of the layers in Figure 2. Ellipses in this ﬁgure illustrate the shape of enclaves (inclusions), and it is clear that they become more and more elongated as we approach the margin of the pluton. Hence, the outer part of the pluton has been ﬂattened during a forceful intrusion history. Metamorphic growth of minerals before, during, and after deformation may also provide important information about the pressure–temperature conditions during deformation, and may contain textures and structures reﬂecting kinematics and deformation history. Hence, sedimentary, magmatic and metamorphic processes may all be closely associated with the structural geology of a locality or region. These examples relate to strain, but structural geologists, especially those dealing with brittle structures of the upper crust, are also concerned with stress. Stress is a somewhat diffuse and abstract concept to most of us, since it is invisible. Nevertheless, there will be no strain without a stress ﬁeld that exceeds the rock’s resistance against deformation. We can create a stress by applying a force on a surface, but at a point in the lithosphere stress is felt from all directions, and a full description of such a state of stress considers stress from all directions and is therefore three-dimensional. There is always a relationship between stress and strain, and while it may be easy to establish from controlled laboratory experiments it may be difﬁcult to extract from naturally formed deformation structures. Structural geology covers deformation structures formed at or near the Earth’s surface, in the cool, upper part of the crustwhere rocks have a tendency to fracture, in the hotter, lower crust where the deformation tends to be ductile, and intheunderlying mantle.It embraces structures at the scale of hundreds of kilometers down to micro- or atomic-scale structures, structures that form almost instantaneously, and structures that form over tens of millions of years. A large number of subdisciplines, approaches and methods therefore exist within the ﬁeld of structural geology. The oil exploration geologist may be considering trap-forming structures formed during rifting or salt tectonics, while the production geologist worries about subseismic sealing faults (faults that stop ﬂuid ﬂow in porous reservoirs). The engineering geologist may consider fracture orientations and densities in relation to a tunnel project, while the university professor uses structural mapping, physical modeling or computer modeling to understand mountain-building processes. The methods and approaches are many, but they serve to understand the structural or tectonic development of a region or to predict the structural pattern in an area. In most cases structural geology is founded on data and observations that must be analyzed and interpreted. Structural analysis is therefore an important part of the ﬁeld of structural geology. Structural data are analyzed in ways that lead to a tectonic model for an area. By tectonic model we mean a model that explains the structural observations and puts them into context with respect to a larger-scale process, such as rifting or salt movements. For example, if we map out a series of normal faults indicating E–W extension in an orogenic belt, we have to look for a model that can explain this extension. This could be a rift model, or it could be extensional collapse during the orogeny, or gravity-driven collapse after the orogeny. Age relations between structures and additional information (radiometric dating, evidence for magmatism, relative age relations and more) would be important to select a model that best ﬁts the data. It may be that several models can explain a given data set, and we should always look for and critically evaluate alternative models. In general, a simple model is more attractive than a complicated one. Planet Earth represents an incredibly complex physical system, and the structures that result from natural deformation reﬂect this fact through their multitude of expressions and histories. There is thus a need to simplify and identify the one or few most important factors that describe or lead to the recognition of deformation structures that can be seen or mapped in naturally deformed rocks. Field observations of deformed rocks and their structures represent the most direct and important source of information on how rocks deform, and objective observations and careful descriptions of naturally deformed rocks are the key to understanding natural deformation. Indirect observations of geologic structures by means of various remote sensing methods, including satellite data and seismic surveying, are becoming increasingly important in our mapping and description of structures and tectonic deformation. Experiments performed in the laboratory give us valuable knowledge of how various physical conditions, including stress ﬁeld, boundary condition, temperature or the physical properties of the deforming material, relate to deformation. Numerical models, where rock deformation is simulated on a computer, are also useful as they allow us to control the various parameters and properties that inﬂuence deformation. Experiments and numerical models not only help us understand how external and internal physical conditions control or predict the deformation structures that form, but also give information on how deformation structures evolve, i.e. they provide insights into the deformation history. In contrast, naturally deformed rocks represent end-results of natural deformation histories, and the history may be difﬁcult to read out of the rocks themselves. Numerical and experimental models allow one to control rock properties and boundary conditions and explore their effect on deformation and deformation history. Nevertheless, any deformed rock contains some information about the history of deformation. The challenge is to know what to look for and to interpret this information. Numerical and experimental work aids in completing this task, together with objective and accurate ﬁeld observations. Numerical, experimental and remotely acquired data sets are important, but should always be based on ﬁeld observations. It is hard to overemphasize the importance of traditional ﬁeld observations of deformed rocks and their structures. Rocks contain more information than we will ever be able to extract from them, and the success of any physical or numerical model relies on the accuracy of observation of rock structures in the ﬁeld. Direct contact with rocks and structures that have not been ﬁltered or interpreted by people or computers is invaluable. Unfortunately, our ability to make objective observations is limited. What we have learned and seen in the past strongly inﬂuences our visual impressions of deformed rocks. Any student of deformed rocks should therefore train himself or herself to be objective. Only then can we expect to discover the unexpected and make new interpretations that may contribute to our understanding of the structural development of a region and to the ﬁeld of structural geology in general. Many structures are overlooked until the day that someone points out their existence and meaning, upon which they all of a sudden appear “everywhere”. 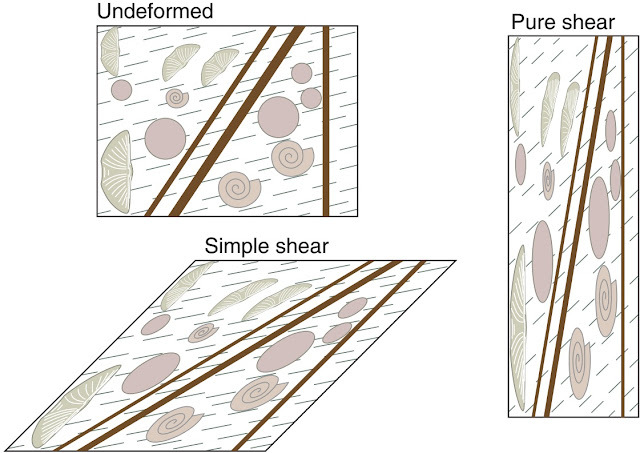 Shear bands in strongly deformed ductile rocks (mylonites). They were either overlooked or considered as cleavage until the late 1970s, when they were properly described and interpreted. Since then, they have been described from almost every major shear zone or mylonite zone in the world. Fig. 3. 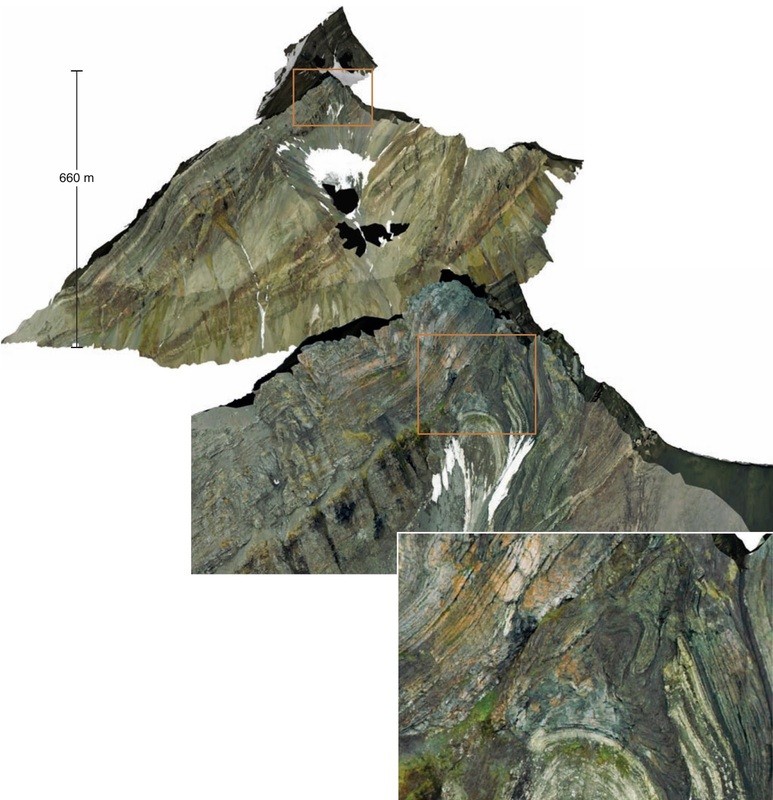 Mediumfjellet, Svalbard, based on LIDAR (LIght Detection And Ranging) data (laser scanning from helicopter) and photos. This type of model, which actually is three dimensional, allows for geometric analysis on a computer and provides access to otherwise unreachable exposures. The lower ﬁgures are more detailed views. Traditional ﬁeldwork involves the use of simple tools such as a hammer, measuring device, topomaps, a hand lens and a compass, and the data collected are mainly structural orientations and samples for thin section studies. This type of data collection is still important, and is aided by modern global positioning system (GPS) units and high-resolution aerial and satellite photos. More advanced and detailed work may involve the use of a portable laser-scanning unit, where pulses of laser light strike the surface of the Earth and the time of return is recorded. This information can be used to build a detailed topographic or geometrical model of the outcrop, onto which one or more high-resolution ﬁeld photographs can be draped. An example of such a model is shown in Figure 3, although the advantage of virtually moving around in the model cannot be demonstrated by a ﬂat picture. Geologic observations such as the orientation of layering or fold axes can then be made on a computer. In many cases, the most important way of recording ﬁeld data is by use of careful ﬁeld sketches, aided by photographs, orientation measurements and other measurements that can be related to the sketch. Sketching also forces the ﬁeld geologist to observe features and details that may otherwise be overlooked. At the same time, sketches can be made so as to emphasize relevant information and neglect irrelevant details. Field sketching is, largely, a matter of practice. Fig. 4. (a) Satellite image of the Canyonlands National Park area, Utah. 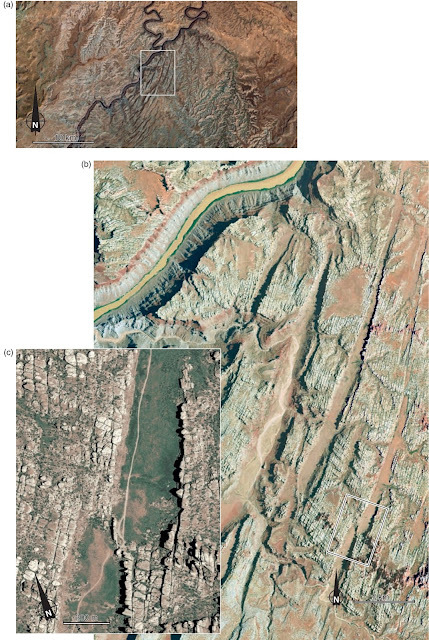 The image reveals graben systems on the east side of the Colorado River. An orthophoto (b) reveals that the grabens run parallel to fractures, and a high-resolution satellite image (c) shows an example of a graben stepover structure. Satellite images, such as those shown in Figure 4a, c, are now available at increasingly high resolutions and are a valuable tool for the mapping of map-scale structures. An increasing amount of such data is available on the World Wide Web, and may be combined with digital elevation data to create three-dimensional models. Orthorectiﬁed aerial photos (orthophotos) may give more or other details (Figure 4b), with resolutions down to a few tens of centimetres in some cases. Both ductile structures, such as folds and foliations, and brittle faults and fractures are mappable from satellite images and aerial photos. In the ﬁeld of neotectonics, InSAR (Interferometric Synthetic Aperture Radar) is a useful remote sensing technique that uses radar satellite images. Beams of radar waves are constantly sent toward the Earth, and an image is generated based on the returned information. The intensity of the reﬂected information reﬂects the composition of the ground, but the phase of the wave as it hits and becomes reﬂected is also recorded. Comparing phases enables us to monitor millimetre-scale changes in elevation and geometry of the surface, which may reﬂect active tectonic movements related to earthquakes. In addition, accurate digital elevation models (see next section) and topographic maps can be constructed from this type of data. Fig. 5. Use of GPS data from stationary GPS stations worldwide over time can be used to map relative plate motions and strain rates. (Left) White arrows (velocity vectors) indicating motions relative to Europe. The vectors clearly show how India is moving into Eurasia, causing deformation in the Himalaya–Tibetan Plateau region. (Right) Strain rate map based on GPS data. Calculated strain rates are generally less than 0.000003 per year. Warm colours indicate high strain rates. Similar use of GPS data can be applied to much smaller areas where differential movements occur, for example across fault zones. GPS data in general are an important source of data that can be retrieved from GPS satellites to measure plate movements (Figure 5). Such data can also be collected on the ground by means of stationary GPS units with down to millimetre-scale accuracy. Conventional paper maps are still useful for many ﬁeld mapping purposes, but rugged laptops, tablets and handheld devices now allow for direct digitizing of structural features on digital maps and images and are becoming more and more important. Field data in digital form can be combined with elevation data and other data by means of a Geographical Information System (GIS). By means of GIS we can combine ﬁeld observations, various geologic maps, aerial photos, satellite images, gravity data, magnetic data, typically together with a digital elevation model, and perform a variety of mathematical and statistical calculations. A digital elevation model (DEM) is a digital representation of the topography or shape of a surface, typically the surface of the Earth, but a DEM can be made for any geologic surface or interface that can be mapped in three dimensions. Surfaces mapped from cubes of seismic data are now routinely presented as DEMs and can easily be analyzed in terms of geometry and orientations. Inexpensive or free access to geographic information exists, and this type of data was revolutionized by the development of Google Earth in the ﬁrst decade of this century. The detailed data available from Google Earth and related sources of digital data have taken the mapping of faults, lithologic contacts, foliations and more to a new level, both in terms of efﬁciency and accuracy. In the mapping of subsurface structures, seismic data are invaluable and since the 1960s have revolutionized our understanding of fault and fold geometry. Some seismic data are collected for purely academic purposes, but the vast majority of seismic data acquisition is motivated by exploration for petroleum and gas. Most seismic data are thus from rift basins and continental margins. Fig. 6. Seismic 2-D line from the Santos Basin offshore Brazil, illustrating how important structural aspects of the subsurface geology can be imaged by means of seismic exploration. Note that the vertical scale is in seconds. Acquisition of seismic data is, by its nature, a special type of remote sensing (acoustic), although always treated separately in the geo-community. Marine seismic reﬂection data (Figure 6) are collected by boat, where a sound source (air gun) generates sound waves that penetrate the crustal layers under the sea bottom. Microphones can also be put on the sea ﬂoor. This method is more cumbersome, but enables both seismic S- and P-waves to be recorded (S-waves do not travel through water). Seismic data can also be collected onshore, putting the sound source and microphones (geophones) on the ground. The onshore sound source would usually be an explosive device or a vibrating truck, but even a sledgehammer or specially designed gun can be used for very shallow and local targets. The sound waves are reﬂected from layer boundaries where there is an increase in acoustic impedance, i.e. where there is an abrupt change in density and/or the velocity with which sound waves travel in the rock. A long line of microphones, onshore called geophones and offshore referred to as hydrophones, record the reﬂected sound signals and the time they appear at the surface. These data are collected in digital form and processed by computers to generate a seismic image of the underground. are called two-dimensional (2-D) seismic data, more and more commercial (petroleum company) data are collected as a three-dimensional (3-D) cube where line spacing is close enough (c. 25m) that the data can be processed in three dimensions, and where sections through the cube can be made in any direction. The lines parallel to the direction of collection are sometimes called inlines, those orthogonal to inlines are referred to as crosslines, while other vertical lines are random lines. Horizontal sections are called time slices, and can be useful during fault interpretation. Three-dimensional seismic data provide unique opportunities for 3-D mapping of faults and folds in the subsurface. However, seismic data are restricted by seismic resolution, which means that one can only distinguish layers that are a certain distance apart (typically around 5–10m), and only faults with a certain minimum offset can be imaged and interpreted. The quality and resolution of 3-D data are generally better than those of 2-D lines because the reﬂected energy is restored more precisely through 3-D migration. The seismic resolution of high-quality 3-D data depends on depth, acoustic impedance of the layer interfaces, data collection method and noise,but would typically be at around 15–20m for identiﬁcation of fault throw. Sophisticated methods of data analysis and visualization are now available for 3-D seismic data sets, helpful for identifying faults and other structures that are underground. Petroleum exploration and exploitation usually rely on seismic 3-D data sets interpreted on computers by geophysicists and structural geologists. The interpretation makes it possible to generate structural contour maps and geologic cross-sections that can be analyzed structurally in various ways, e.g. by structural restoration. 3-D seismic data form the foundation of our structural understanding of hydrocarbon ﬁelds. Other types of seismic data are also of interest to structural geologists, particularly seismic information from earthquakes. This information gives us important information about current fault motions and tectonic regime, which in simple terms means whether an area is undergoing shortening, extension or strike-slip deformation. Offshore collection of seismic data is done by a vessel that travels at about 5 knots while towing arrays of air guns and streamers containing hydrophones a few meters below the surface of the water. The tail buoy helps the crew locate the end of the streamers. The air guns are activated periodically, such as every 25m (about every 10 seconds), and the resulting sound wave that travels into the Earth is reﬂected back by the underlying rock layers to hydrophones on the streamer and then relayed to the recording vessel for further processing. The few sound traces shown on the ﬁgure indicate how the sound waves are both refracted across and reﬂected from the interfaces between the water and Layer 1, between Layer 1 and 2, and between Layer 2 and 3. Reﬂection occurs if there is an increase in the product between velocity and density from one layer to the next. Such interfaces are called reﬂectors. Reﬂectors from a seismic line image the upper stratigraphy of the North Sea Basin (right). Note the upper, horizontal sea bed reﬂector, horizontal Quaternary reﬂectors and dipping Tertiary layers. Unconformities like this one typically indicate a tectonic event. 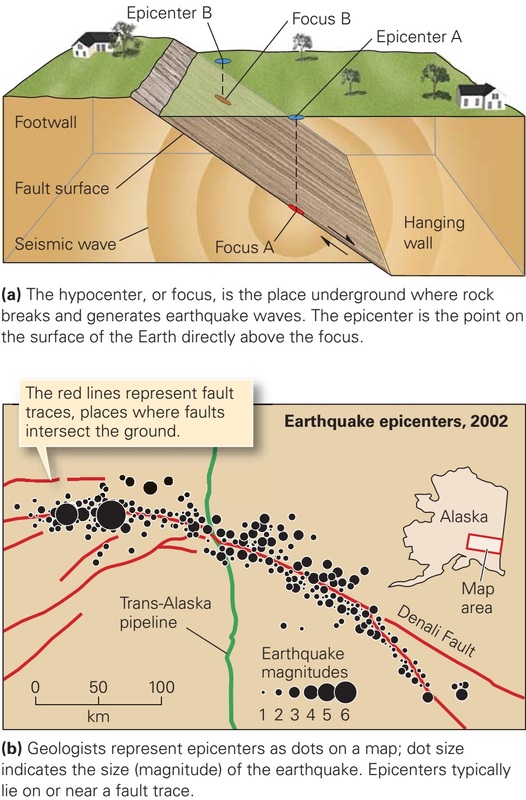 Note that most seismic sections have seconds (two-way time) as vertical scale. The simplest way to record the details of a surface outcrop is by measuring and describing a vertical stratigraphic section. Ideally, the location of the section should be chosen to include important stratigraphic features, such as formation contacts, but, in practice, the location is commonly determined by accessibility-the presence of bars or beaches allowing us to walk along a river cut or a negotiable gully cutting through a cliff section. Only those geologists who use their profession as an excuse to practice their favorite sport of mountaineering will be able to apply sound geological principles to the choice of section. The rest of us take what we can reach. In reconnaissance work, rapid measurement and description techniques are acceptable. For example, a hand-held altimeter (aneroid barometer) may be used in conjunction with dip measurements to reconstruct stratigraphic thicknesses using simple trigonometry. Another method that is commonly described in field handbooks is the pace-and-compass technique, suitable for estimating thicknesses across relatively level ground, given accurate stratigraphic dip. The same distances may be measured from maps or air photographs. Long experience with these methods has shown that they are not very reliable; errors of up to 50% can be expected. Fig. 1. 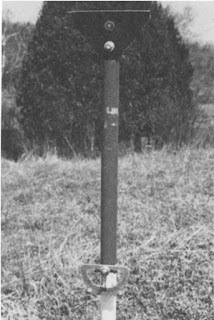 A "pogo stick" for measuring surface sections, showing sighting bar and clinometer on upper 50 em of rod. Fig. 2. Use of pogo stick in section measurement. By far the simplest and most accurate method for measuring a section is the use of a Jacob's staff or "pogo stick." 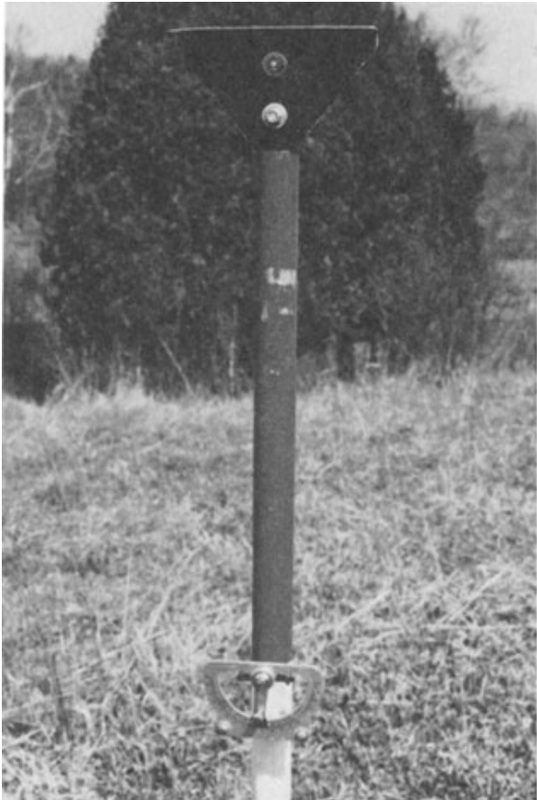 The stick is constructed of a 1.5-m wooden rod, with a clinometer and sighting bar (Fig. 1). 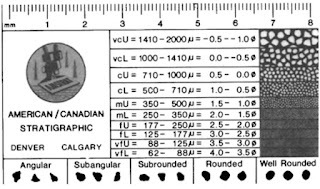 The clinometer is preset at the measured structural dip and can then be used to measure stratigraphic thickness as fast as the geologist can write down descriptive notes (Fig. 2). The best technique is to use two persons. The senior geologist observes the rocks and makes notes, while the junior (who can be an inexperienced student) "pogo's" his or her way up the section recording increments of 1.5 m on a tally counter and collecting samples. The length 1.5 m is convenient for all but the tallest or shortest persons, although it can be awkward to manipulate on steep slopes. The only skill required by the pogo operator is the ability to visualize the dip of the strata in three dimensions across whatever terrain the geologist may wish to traverse. This is important so that the pogo can at all times be positioned perpendicular to bedding with the line of sight extending from the sighting bar parallel to bedding. It is far preferable to measure up a stratigraphic section rather than down, even though this often means an arduous climb up steep slopes. Many geologists working by helicopter in rugged terrain have made their traverses physically easier by working downhill wherever possible. But, not only is it difficult to manipulate a pogo stick downward in a section, it makes it more difficult for the geologist to comprehend the order of events he or she is observing in the outcrops. The geologist should search for the cleanest face on which to make observations. Normally, this should be weathered and free of vegetation, talus, or rain wash. Most sedimentary features show up best where they have been etched out by wind or water erosion, or where a face is kept continuously clean and polished by running water, as in a river bed or an intertidal outcrop. Such features rarely show up better on fresh fracture surfaces, so a hammer should only be used for taking samples. Carbonates may benefit from etching with dilute acid. The geologist should methodically examine both vertical cuts and the topside and underside of bedding planes; all may have something to reveal. It is also useful, on larger outcrops, to walk back and examine them from a distance, even from a low-flying helicopter or from a boat offshore, as this may reveal large-scale channels, facies changes, and many other features of interest. A different technique may be used to document such large outcrops, which may conveniently be termed lateral profiling to distinguish it from vertical profiling. We discuss this in the next section. If attempts are made to record every piece of field information on the computer file, the resulting file is likely to be very large and cumbersome. Storage and retrieval programming may consume far more time than the original field work, unless the geologist can draw on some preexisting program package. This leads to the second problem. If data are to be coded in the field or if a preexisting program system is to be used, it means that decisions will already have been made about what data are to be recorded and how they are to be recorded before the geologist goes into the field. If the geologist knows in advance what is likely to be found, as a result of some previous descriptions or reconnaissance work, this may be satisfactory, but in the case of isolated field areas such foreknowledge may not be available. In this case, there is a certain risk involved in having the observation system designed in advance. Individual geologists vary in their interests and in the observations they make and, of course, the rocks are highly variable, so that it is not possible to design a single, all-purpose, section-measuring software package. Specialized systems have to be designed for specific projects, and although this leads to expense in programming and debugging, it means that the program can be designed for the specific type of output required. It should not be forgotten, though, that programming, as such, is a technical, not a scientific, skill. Students and other workers who write programs for their research get few points for producing a workable program, only for the interesting scientific ideas their programming allows them to test. For example, an obvious application of computerized stratigraphic section data is in the statistical study of facies associations and cyclic sedimentation. Fig. 3. A form for field recording of stratigraphic sections that can be processed by a computer. Heavy horizontal lines define the input for each descriptive unit. Items are entered by making a pencil mark in the dashed line tracks. An example of a successful computerized section-description system is that devised by P.F. Friend and his students for studying Devonian nonmarine clastic sequences in East Greenland (Alexander-Marrack et aI., 1970; Friend et aI., 1976). They designed a form with spaces to be filled in by the geologist in the field (Fig. 3). Marks were made in the appropriate tracks with a soft pencil, corresponding to the observed properties. These cards could be fed directly into a computer using an optical mark page reader. The data form provides a choice of items to be filled in within each small block outlined by a solid line. Areas of the card delimited by heavy horizontal lines across the full width of the page correspond to individual bedding units recognized in the field. Items encoded on the card include thickness of unit, exposed/covered choice, color, grain size, pebbles (present/ absent), nature of basal contact, presence of carbonate, internal structures, and paleocurrent measurements. The range of possible observations is limited by the card. For example, the method would not be suitable if the section was found to contain thick limestone intervals because, although carbonate content can be indicated, there are no spaces to record typical carbonate sedimentary features, such as ooliths, birdseye structures, stromatolites, etc. Also, the method is suitable only for recording vertical stratigraphic changes. The presence of lateral facies changes or the exposure of a large channel could not be recorded in this system. The particular system designed by Friend worked very well for a team of about a dozen geologists working over three field seasons, but it is unlikely that it could be applied anywhere else without modification. Unless a geologist is committed to doing much the same type of field geology for a long period, the investment of time and resources into designing and setting up such a system may not be worth the effort. In some cases, the field records must, in any case, be modified following laboratory work. This is particularly the case with carbonate sediments, which commonly are best studied in polished hand specimens or thin sections. In this case, much of the effort of the field geologist must be devoted to ensuring that a sufficiently rigorous sample collection routine is observed. In the long run, it may be simpler to stay with an oldfashioned field notebook for field observations. Computer files can be built at a later date from corrected data, using a file structure designed for a specific purpose. For example, structural data, paleocurrent data, and vertical facies succession data lend themselves readily to processing in special-purpose computer files, which can exploit one of the main advantages of the computer to the full, namely, its ability to carry out complex or repetitive numerical manipulations with great rapidity. Some stratigraphic units are essentially tabular at the scale of the outcrop and can be quickly and accurately documented using vertical profiles, in the way outlined in the previous section. However, some types of sedimentary assemblage contain complex facies changes, which may be at a small enough scale to observe in individual outcrops, especially in large outcrops. For example, a reef core, with its reef-front talus slope and back-reef lagoonal deposits, or a large fluvial or submarine-fan channel, with its fill of complex bar deposits, may be spectacularly displayed in a road cut or mountainside. The measurement of a few vertical sections across such an outcrop is a quite inadequate way to document the wealth of facies detail that may be available. An alternative field method is to construct lateral profiles, long sections that encompass the full vertical stratigraphic height of the outcrop, and also extend along the strike as far as possible, to illustrate the facies changes. These may be constructed by careful surveying, but a much quicker method is to make use of photographic mosaics of the outcrop. The geologist moves well back from the exposed face, perhaps as much as several hundred meters in the case of a very large outcrop, and carries out a traverse parallel to the face, taking a series of overlapping frames until he or she has covered the entire outcrop. By taking care to remain at the same distance from the face, each frame will be at approximately the same scale. The same end can be achieved by taking photographs from a boat, or even from an aircraft flying low over the outcrop. The prints are carefully overlapped and mounted in the office in order to construct a mosaic, which can then be used in the field as a kind of topographic map base on which to enter stratigraphic and sedimentologic detail. Some scale distortions inevitably arise. Outcrops are rarely flat, and projections and gullies will not fit together precisely in the mosaic because of the differing perspectives of adjacent frames. Such distortions are trivial relative to the immense amount of detail that can be shown on such profiles, and if accurate measurements of individual features are required, they should, in any case, be made in the field and not from the photograph. This is a subjective operation based on the rock types present, the quality and accessibility of the exposure, and the amount of detail required in the description. Very detailed descriptions may require subdivision into units containing (for example) a single mudstone lens or crossbed set, and will therefore be on the order of a few centimeters or tens of centimeters thick. Thicker units can be defined by grouping similar rock types, but sedimentologically useful detail may be lost thereby. For each unit, the kinds of observations listed in the succeeding paragraphs are made where appropriate. Fig. 4. An example of a lateral profile. Above is the outcrop photo-mosaic, and below is the interpretation made from photo and outcrop examination. This example illustrates a succession of compound bars deposited in a fluvial system. A major internal bounding surface (labelled B) indicates a pause in deposition and the initiation of a new channel. Beds above this surface downlap on to it, and are interpreted as lateral accretion surface. In the case of lateral profiles (Fig. 4), among the most valuable kinds of observation that can be made is the documentation and classification of the various kinds of bounding surface that separate stratigraphic units. These range from the simple bedding plane surfaces that separate individual crossbed sets through the surfaces that bound channels and bars to the major (usually horizontal) surfaces that delimit mappable stratigraphic units (formations, members, etc.). Table 1. 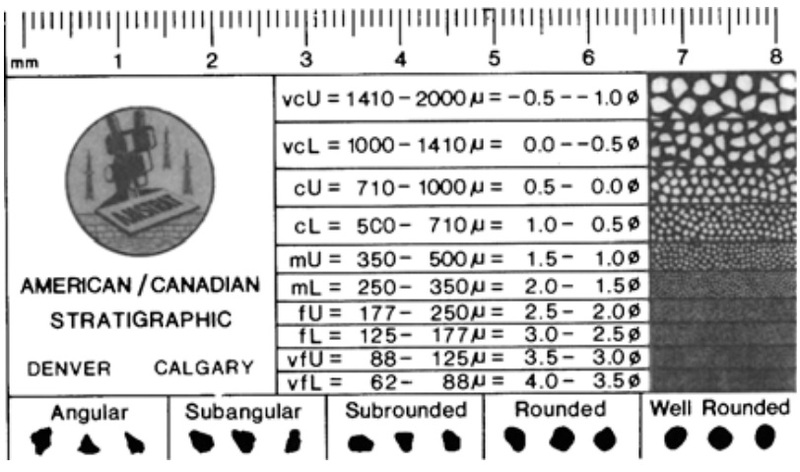 Standard grain-size scales for carbonate and clastic sediments. Fig. 5. A grain-size comparison chart, for use in the field or for logging well cuttings or cores. Lithologic classification of clastic rocks can usually be done satisfactorily by visual observation in the field, without the necessity of follow-up laboratory work. 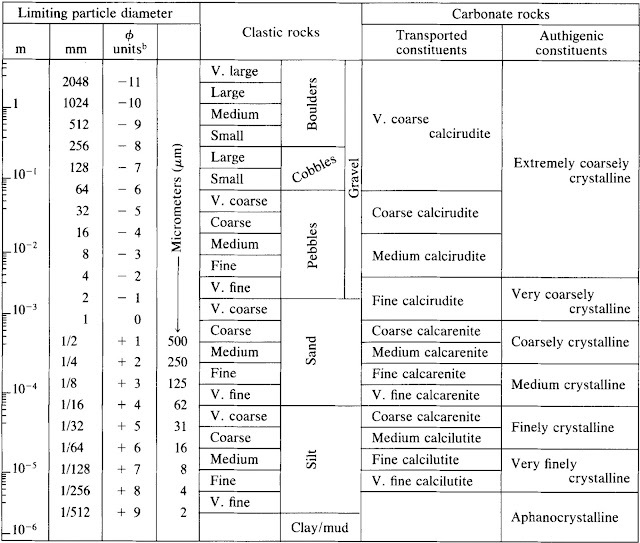 Classification is based on grain size (Table 1), which is easily measured on the outcrop. 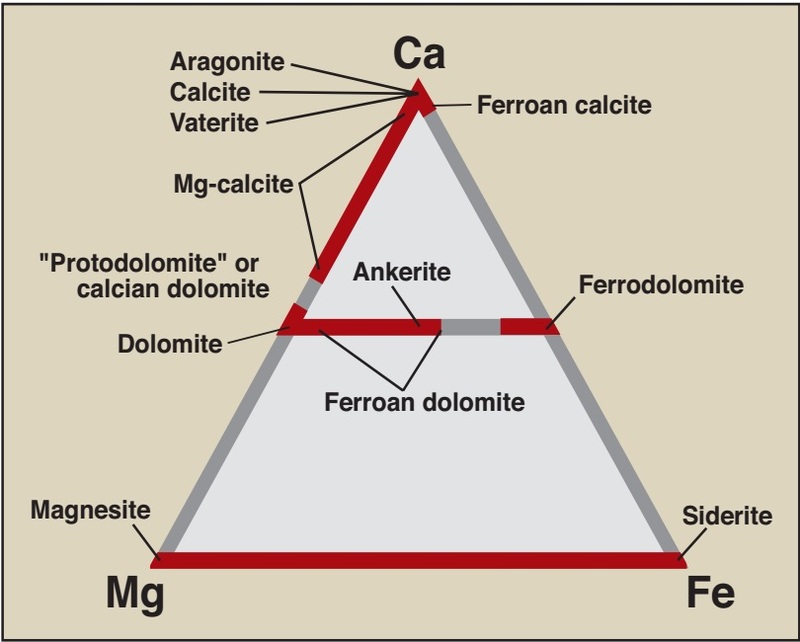 For sand grade rocks, it is useful to take into the field a grain size chart (Fig. 5) or a set of sand samples each representing one phi class interval through the sand size ranges. These are used for comparison purposes and permit recognition of the main sand grade subdivisions: very fine, fine, medium, coarse, and very coarse. Many tests by the author and others have shown that such observations provide adequate, accurate information on the modal size range of the sandstones. The description should be modified by appropriate adjectives if sorting characteristics require it; for example, pebbly coarse-grained sandstone, silty mudstone, etc. For the purpose of regional facies analysis, this is usually the only kind of grain size information required. Skewness, kurtosis, and other statistical data are not needed. Siltstone and mudstone can be distinguished in a hand specimen by the presence or absence of a gritty texture, as felt by the fingers or the tongue. This is, of course, a crude method and should be checked by making thin sections of selected samples. However, field identifications of this type commonly are adequate for the purpose of facies analysis. Fine-grained rocks, including those consisting of a mixture of sandstone, siltstone, and mudstone, are difficult to classify and describe. Dean et al. (1985) discussed the methods used in the Deep Sea Drilling Project based on smear slides of soft sediments made on board ship. For conglomerates, maximum clast size is often a useful parameter to measure. Typically, this is estimated by taking the average of the 10 largest clasts visible within a specified region of an outcrop, such as a given area of a certain bedding plane. In thick conglomerate units, it may be useful to repeat such measurements over regular vertical intervals of the section. It is also important to note the degree of sorting, clast shape and roundness, matrix content, and fabric of conglomerate beds. For example, does the conglomerate consist predominantly of very well rounded clasts of approximately the same size, or is it composed of angular fragments of varying size and shape (breccia)? Do the clasts "float" in abundant matrix, a rock type termed matrix-supported conglomerate, or do the clasts rest on each other with minor amounts of matrix filling the interstices-clast-supported conglomerate? 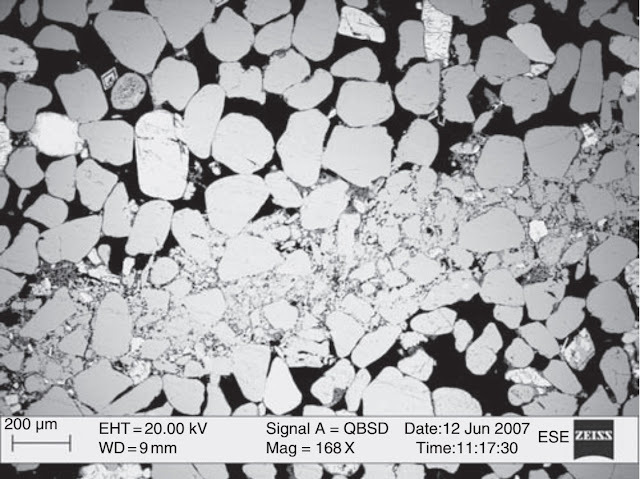 Carbonate rocks commonly cannot be described adequately or accurately in outcrops and require description from thin sections or polished sections observed under a low-power microscope. Among the reasons for this are the ready susceptibility of carbonate rocks to finescale diagenetic change, and the fact that weathering behavior in many cases obscures rather than amplifies such changes, as seen in outcrops. Another important reason for not relying on outcrop observation is that some of the types of information required for carbonate facies analysis are simply too small to be seen properly with the naked eye. These include mud content, certain sedimentary textures, and biogenic features. Field geologists traditionally take a dropper bottle of 10% hydrochloric acid with them to test for carbonate content and to aid in distinguishing limestone from dolomite (on the basis of "fizziness"). However, for research purposes, the test is quite unsatisfactory, and the geologist is advised to abandon the acid bottle (and stop worrying about leakage corroding packsacks). Dolomite commonly can be distinguished from limestone by its yellowish weathering color in the field, but a better field test is to use alizarin red-S in weak acid solution. This reagent stains calcite bright pink but leaves dolomite unstained. In both hand specimens and thin sections, use of this reagent can reveal patterns of dolomitization on a microscopic scale. Because of the problem with carbonate rocks discussed previously, the geologist is advised not to rely on field notes for facies analysis of these rocks, but to carry out a rigorous sampling program and supplement (and correct) the field notes using observations made on polished slabs or thin sections. Sampling plans are discussed later in this section. Laboratory techniques for studying carbonates are described by Wilson (1975). Evaporites are difficult to study in surface outcrops. They are soft and recessive and commonly poorly exposed, except in arid environments. Like carbonates, they are highly susceptible to diagenetic change, so that field observations must be supplemented by careful laboratory analysis. Only recently have sedimentological methods been applied to the study of evaporites (observations of grain size, textures, bedding, structures, etc.) and this subject offers hope for exciting developments. Mixed carbonate-clastic sediments are common and are typically dealt with as if they were carbonate or clastic, which may not be the most effective way to emphasize subtle lithologic characteristics. Mount (1985) discussed the problems of classifying these rocks and suggested some methodological approaches. Porosity and permeability are of particular interest if the rocks are being studied for their petroleum potential. Observations in surface outcrops may be of questionable value because of the effects of surface weathering on texture and composition, but the geologist should always break off a fresh piece of the rock and examine the fracture surface because such observations commonly constitute the only ones made. The geologist should distinguish the various types of porosity, such as intergranular (in detrital rocks), intercrystalline (in chemical rocks), and larger pores, such as vugs, birdseye texture, moulds of allochems, such as oolites or pellets, fossil moulds, fracture porosity, etc. More accurate observations may be made from thin sections, and samples may be submitted to a commerical laboratory for flow tests if required. Porosity types should be reported in terms of the estimated percentage they occupy in the bulk volume of the sample. Color mayor may not be an important parameter in basin analysis. Individual lithologic units may display a very distinctive color, which aids in recognition and mapping. Sometimes it even permits a formation to be mapped almost entirely using helicopter observations from the air, with a minimum of ground checking. However, the sedimentological meaning and interpretation of color may be difficult to resolve. Some colors are easily interpreted-sandstones and conglomerates commonly take on the combined color of their detrital components, pale greys and white for quartzose sediments and darker colors for lithic rocks. As noted, limestones and dolomites may also be distinguished using color variations. However, color is strongly affected by depositional conditions and diagenesis, particularly the oxidation-reduction balance. Reduced sediments may contain organically derived carbon and Fe2+ compounds, such as sulphides, imparting green or drab gray colors. Oxidized sediments may be stained various shades of red, yellow, or brown by the presence of FeH compounds, such as hematite and limonite. However, local reducing environments, such as those created around decaying organisms, may create localized areas or spots of reduction color. Color can change shortly after deposition, as shown, for example, by Walker (1967) and Folk (1976). Moberly and Klein (1976) found that oxidation and bacterial action caused permanent color changes when fresh sediments, such as deep sea cores, are exposed to the air. Thus, the problem is to decide how much time to devote to recording color in the field. Ideally, each descriptive unit in the stratigraphic section should be studied for color using a fresh rock-fracture surface and comparisons to some standard color scheme, such as the U.S. National Research Council RockColor Chart (Goddard et aI., 1948). In practice, for the purpose of facies and basin analysis, such precision is not required. Simple verbal descriptions, such as pale gray, dark redbrown, etc., are adequate. More precise descriptions may be useful if detailed studies of diagenetic changes are to be undertaken, but recent work has shown that such studies may give misleading results if carried out exclusively on surface exposures because of the effects of recent weathering (Taylor, 1978). Table 2. Scale of stratification thickness. An important type of observation, particularly in clastic rocks, is the thickness of bedding units. Thickness relates to rate of environmental change and to depositional energy. In some cases, bed thickness and maximum grain size are correlated, indicating that both are controlled by the capacity and competency of single depositional events. Bed thickness changes may be an important indicator of cyclic changes in the environment and sedimentologists frequently refer to thinning upward and fining upward or coarsening and thickening upward cycles. It is important to distinguish bedding from weathering characteristics. For example, a unit may split into large blocks or slabs upon weathering, but close examination may reveal faint internal bedding or lamination not emphasized by weathering. 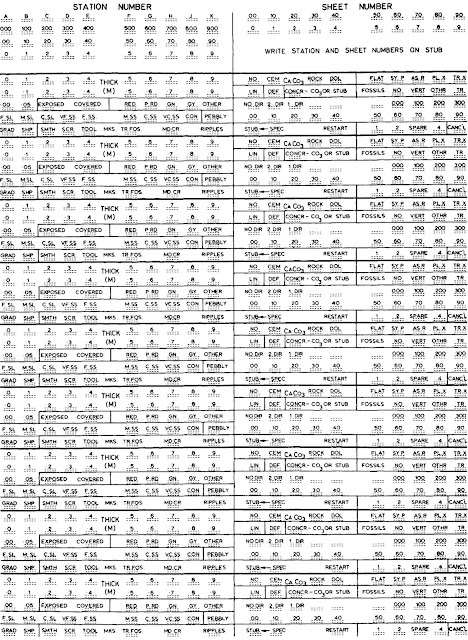 Bedding can be measured and recorded numerically, or it can be described in field notes semiquantitatively using the descriptive classification given in Table 2. Sedimentary structures include a wide variety of primary and postdepositional features. All individually yield useful information regarding depositional or diagenetic events in the rocks, and all should be meticulously recorded and described in the context of the lithology and grain size of the bed in which they occur. The assemblage of structures and, in some cases their orientation, can yield vital paleogeographic information. Table 3. 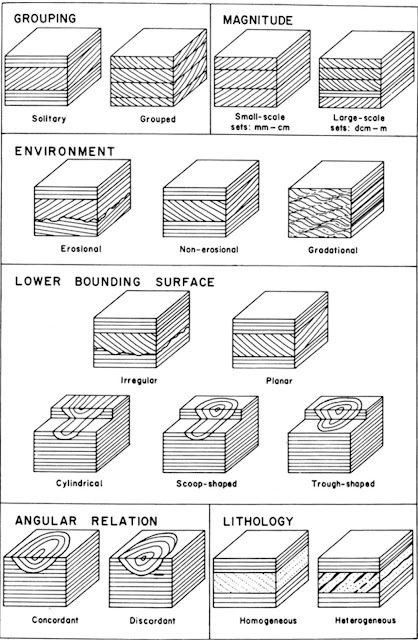 Classification of inorganic sedimentary structures. 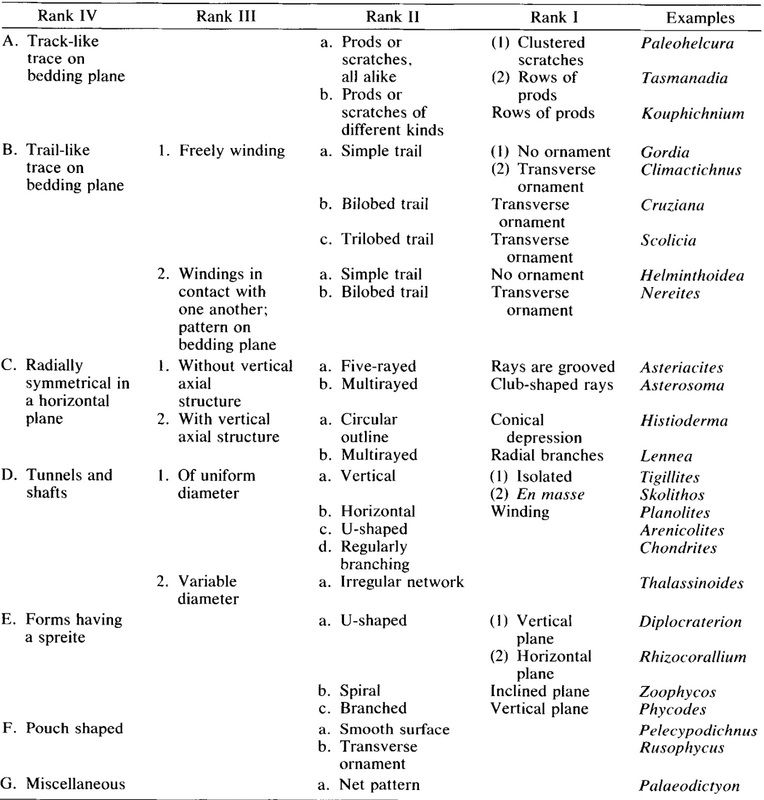 Inorganic sedimentary structures can be divided into three main genetic classes, as shown in Table 3. Sediment carried in turbulent suspension by mass gravity transport processes, such as debris flows and turbidity currents, is subjected to internal sorting processes. When the flow slows and ceases, the sorting may be preserved as a distinct texture termed graded bedding. 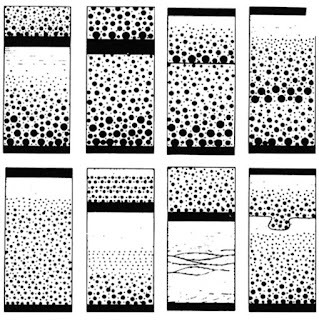 Grading commonly consists of an upward decrease in grain size, as illustrated in Fig. 6; this is termed normal grading. However, certain sedimentary processes result in an upward decrease in grain size, termed inverse grading. Clastic grains can be divided into two classes on the basis of their interactive behavior. Cohesive grains are those that are small enough that they tend to be bound by electrostatic forces and thus resist erosion once deposited on a bed. This includes the clay minerals and fine silt particles. A range of erosional sedimentary structures is present in such rocks (Table 3). Larger clastic grains, including siliciclastic, evaporite, and carbonate fragments, of silt to cobble size are noncohesive. They are moved by flowing water or wind as a traction carpet along the bed or by intermittent suspension. The dynamics of movement causes the grains to be moulded into a variety of bedforms, which are preserved as crossbedding within the rock. Those formed from unidirectional water currents, such as are found in rivers and deltas, and oceanic circulation currents in marine shelves and the deep sea. Those formed by oscillatory water-currents, including both wave- and tide-generated features. Although the time scale of current-reversal is, of course, quite different, there are comparable features between the structures generated in these different ways. Those formed by air currents. Such currents may be highly variable, and the structure of the resulting deposits will be correspondingly complex. However, examination of ancient wind-formed (eolian) rocks indicates some consistent and surprisingly simple patterns. Recognition in the outcrop or in the core of the diagnostic features of these crossbedding classes is an invaluable aid to environmental interpretation, and therefore crossbedding structures must be examined and described with great care wherever they are found. Fig. 8. Growth offoresets, advance of a fiat-topped bar and development of size sorting by migration of ripples along the bar top. Note increase in foreset grain-size from (a) to (b) as ripple crest reaches avalanche face. The components of crossbedding are illustrated in Fig. 7. A foreset represents an avalanche face, down which grains roll or slump or are swept down by air or water currents. Fig. 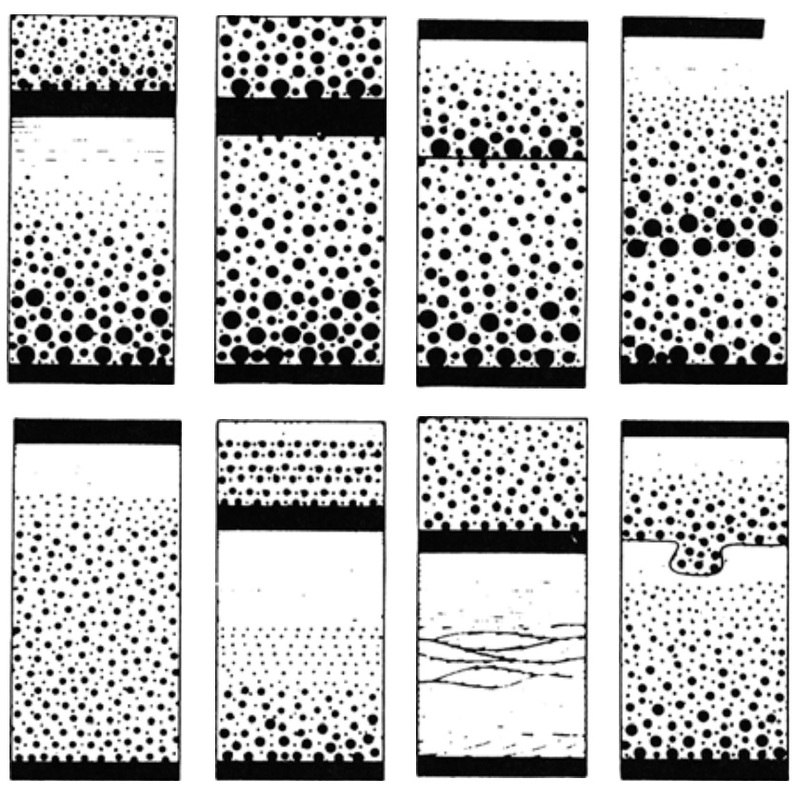 8 shows one of many types of bedform morphology illustrating the way grains advance up the up-current (stoss) side of the bedform and are fed to a continuously advancing or prograding down-current foreset (lee) surface. In this case, the grains are transported by ripples, which contain internal foreset structure. 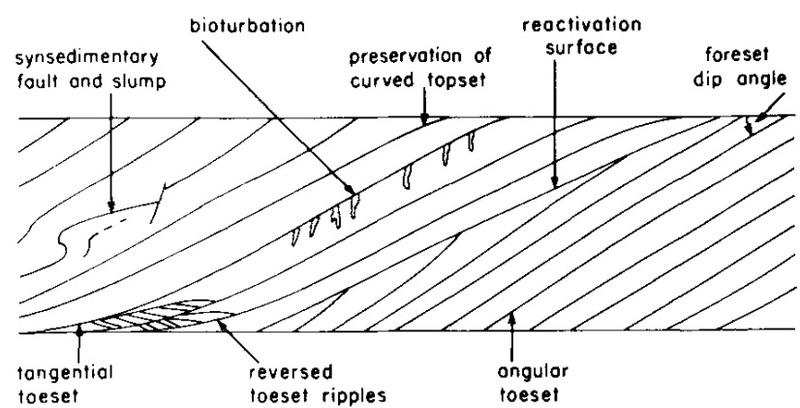 Continuous deposition produces repeated foreset bedding or lamination as the bedform accretes laterally, resulting in a crossbed set (McKee and Weir, 1953). 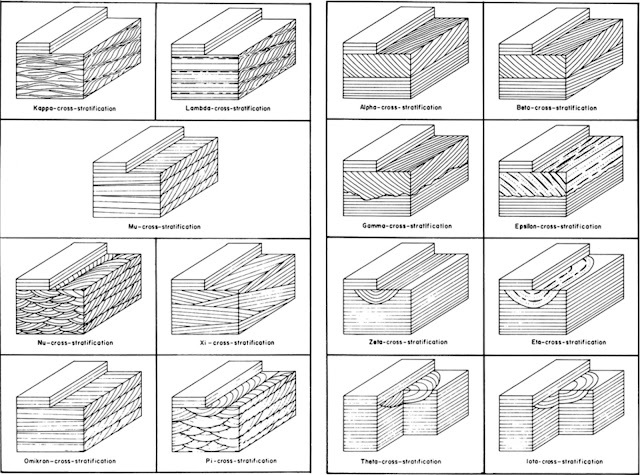 A coset is defined as a sedimentary unit made up of two or more sets of strata or crossbedding separated from other cosets by surfaces of erosion, nondeposition, or abrupt change in character (McKee and Weir, 1953). Note that a coset can contain more than one type of bedding. Fig. 9. Criteria used in the description and definition of crossbedding types. Fig. 10. Internal structures of crossbedding. 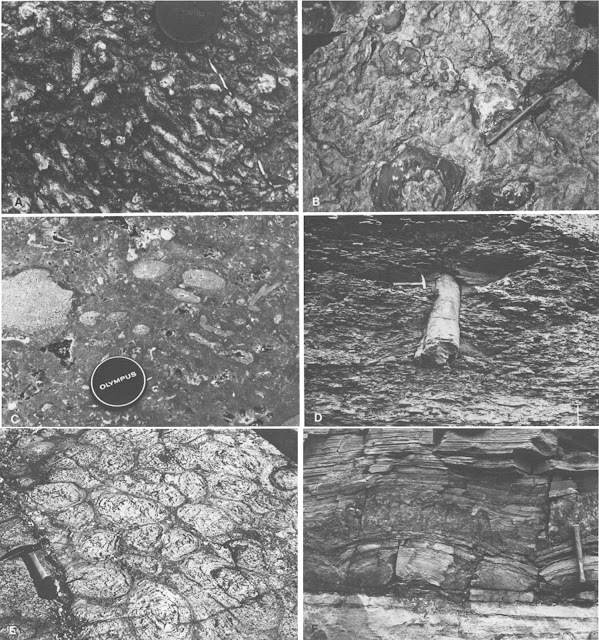 When describing crossbedding, attention must be paid to seven attributes, as illustrated in Figs. 9 and 10. All but the last of these were first described in detail in an important paper on crossbedding classifiction by Allen (1963). In the field, crossbeds are classified first according to whether they are solitary or grouped. Solitary sets are bounded by other types of bedding or crossbedding, grouped sets are co sets consisting entirely of one crossbed type. Scale is the next important attribute. In water-laid strata, it is found that a bedform amplitude of about 5 cm is of hydrodynamic significance and, accordingly, this amplitude is used to subdivide crossbeds into small- and largescale forms. 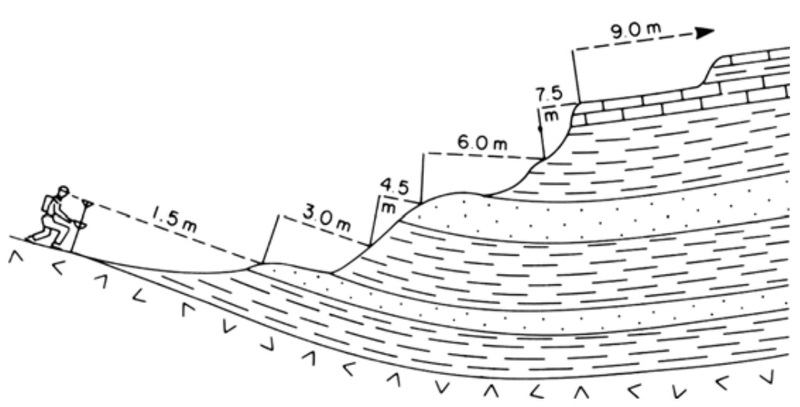 An assumption is made that little or none of the top of a bedform is lost to erosion prior to burial; generally, the amount lost seems to increase in approximate proportion to the scale of the bedform or the thickness of the crossbed structure. Forms thinner than 5 cm are termed ripples, whereas forms larger than 5 cm are given a variety of names, reflecting in part a diversity of hydrodynamic causes and in part a considerable terminological confusion. Most crossbed sets contain foresets that terminate at the base of the set, in which case the foresets are said to be discordant. In rare cases where the crossbeds are parallel to the lower bounding surface, as occurs in some sets with curved lower surfaces, the crossbeds are described as concordant. The crossbeds may show either homogeneous or heterogeneous lithology. Homogeneous cross beds are those composed offoresets whose mean grain size varies by less than two phi classes. Heterogeneous crossbeds may contain laminae of widely varying grain size, including interbedded sand and mud or sand and gravel, possibly even including carbonaceous lenses. The minor internal structures within crossbeds are highly diagnostic of their origin (Fig. 10). The dip angle of the fore set relative to the bounding surface is of considerable dynamic significance. Are the foresets curved, linear, or irregular in sections parallel to the dip? Is the direction of dip constant, or are there wide variations or reversals of dip within a set or between sets? Do the sets contain smaller scale hydrodynamic sedimentary structures on the foresets, and if so, what is the dip orientation of their foresets relative to that of the larger structure? What is the small-scale internal geometry of the foresets-are they tabular, lens, or wedge shaped? Do they display other kinds of sedimentary structures, such as trace fossils, synsedimentary faults, or slumps? Are reactivation surfaces present? 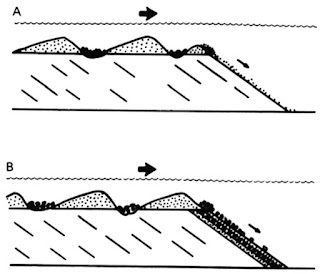 These represent minor erosion surfaces on bedforms that were abandoned by a decrease in flow strength and then reactivated at some later time (Collinson, 1970). Fig. 11. The 15 crossbedding types defined by Allen (1963), distinguished using the criteria set out in Fig. 9. Fig. 12. Types of crossbedding, as observed in outcrops. A. Climbing ripple cross-lamination. Note increase in angle of climb, a common feature that indicates decrease in flow strength and increase in detritus settling from suspension. Fluvioglacial, Pleistocene, Ottawa. B. Ladderback ripples. An older ripple set is visible as short segments of ripple crest preserved in the troughs of a younger set formed in a perpendicular direction. Fluvial, Karoo Supergroup, Beaufort West, South Africa. 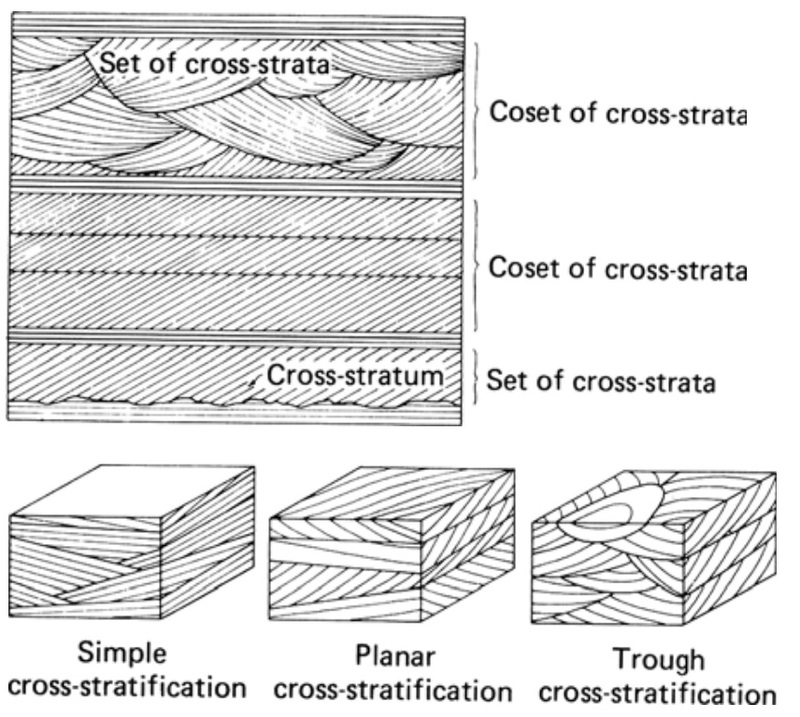 C. A coset of planar cross-strata (alpha type of Fig. 11). Note consistency of orientation. Fluvial, Cretaceous, Banks Island, Arctic Canada. D. Planar crossbed set in a clastic limestone. Foresets are emphasized by chert lenses. Shallow marine, Mississippian, northeast Alaska. E. Oblique section through a solitary trough crossbed set with trace fossils. Shallow marine, Cretaceous, Banks Island, Arctic Canada. 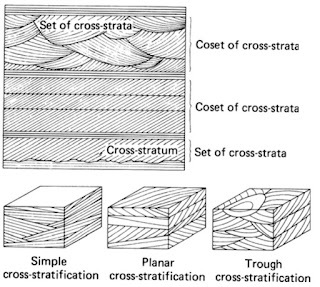 F. A coset of trough cross strata (pi type of Fig. 11). Fluvial, Devonian, Somerset Island, Arctic Canada. G. Bedding plane view of a trough crossbed. The curved foresets dip toward the left. Fluvial, Huronian, (Proterozoic), near Elliot Lake, Ontario. H. Bedding plane exposure of straight-crested megaripples. Shallow marine, Karoo Supergroup, near Durban, South Africa. I. Herringbone crossbedding: five planar crossbed sets showing reversals of flow direction. Shallow marine, Permian, Ellesmere Island, Arctic Canada. J. Low-angle, curved crossbedding, possibly hummocky cross-stratification, with the trace fossil Ophiomorpha. Shallow marine, Eocene, Banks Island, Arctic Canada. K. Large-scale crossbedding (epsilon type of Fig. 11). Fluvial point bar, Eocene, Ellesmere Island, Arctic Canada. L. Large scale crossbedding (epsilon type of Fig. 11). Fluvial point bar, Carboniferous, Alabama. M. Large-scale eolian crossbedding, Jurassic Navajo Formation, Zion National Park, Utah. N. Talus slope of a reef composed of coarse, crinoidal calcarenite and calcirudite, Devonian, Princess Royal Islands, Arctic Canada. These seven attributes can be used to classify crossbed sets in the field. It is time-consuming to observe every attribute of every set, but it is usually possible to define a limited range of cross bed types that occur repeatedly within a given stratigraphic unit. These can then be assigned some kind of local unique descriptor, enabling repeated observations to be recorded rapidly in the field notebook. One way to classify cross bed sets is to use a published classification system, of which that erected by Allen (1963) is the most complete. This is illustrated in Fig. 11. However, this classification does not encompass any of the internal structures illustrated in Fig. 10. Allen's classifiction has become widely used, particularly in descriptions of nonmarine rocks; some of his Greek letter names are well known among sedimentologists and are used as a convenient shorthand. However, care should be taken to supplement this classification with observations of the internal structures. Examples of crossbedding in outcrops are illustrated in Fig. 12. A vital component of basin analysis is an investigation of sedimentological trends, such as determining the shape and orientation of porous rock units. Paleocurrent analysis is one of several techniques for investigating sedimentary trends based, among other things, on studying the size, orientation, and relative arrangement of crossbedding structures. Therefore, when describing outcrop sections, it is essential to record the orientation of crossbed sets. Fig. 13. 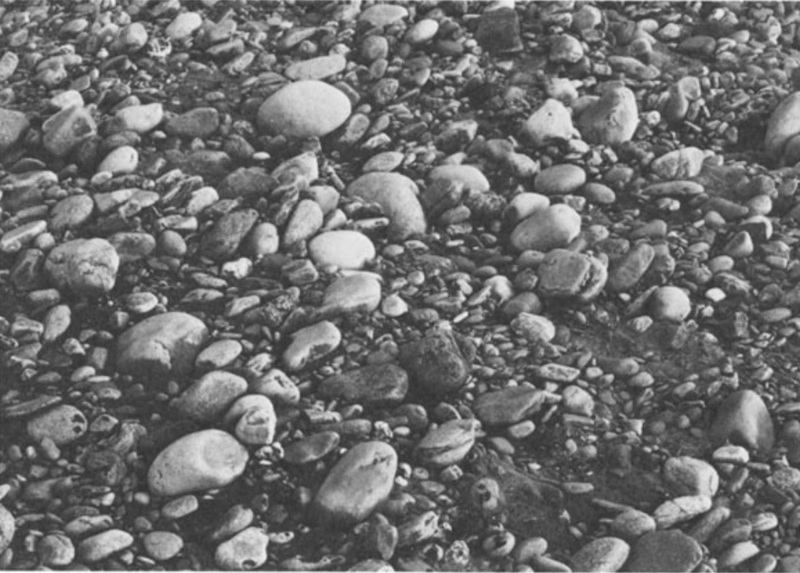 Clast imbrication in a modern river, indicating flow from left to right. Ellesmere Island, Arctic Canada. Crossbedding represents a macroscopic orientation feature, but each clastic grain is individually affected by a flow system and may take up a specific orientation within a deposit in response to flow dynamics. The longest dimension of elongated particles tends to assume a preferred position parallel or perpendicular to the direction of movement and is commonly inclined upflow, producing an imbricated or shingled fabric. This fabric may be present in sandsized grains and can be measured optically, in thin section (Martini, 1971) or using bulk properties, such as dielectric or acoustic anisotropy (Sippel, 1971). In recent years, paleomagnetic data have also been recognized to contain much useful information relating to primary sedimentary fabrics. Eyles et al. (1987) discussed magnetic orientation and anisotropy data with reference to the depositional processes of till and till-like diamict deposits. Oriented specimens must be collected in the field for such an analysis. In conglomerates, an imbrication fabric commonly is visible in an outcrop and can be readily measured by a visual approximation of average orientation or by laborious individual measurements of clasts. Fig. 13 illustrates imbrication in a modern river bed. It has been found that in nonmarine deposits, in which imbrication is most common, the structure is one of the most accurate of paleocurrent indicators (Rust, 1975). Fig. 14. A. Plane bedding in sandstone containing dark, sand-sized comminuted carbonaceous debris, Eocene, Ellesmere Island, Arctic Canada. B. Bedding plane exposure of a sandstone such as that in photo A, showing parting lineation, Upper Proterozoic, Banks Island, Arctic Canada. Grain sorting is responsible for generating another type of fabric in sand grade material, which is also an excellent paleocurrent indicator. 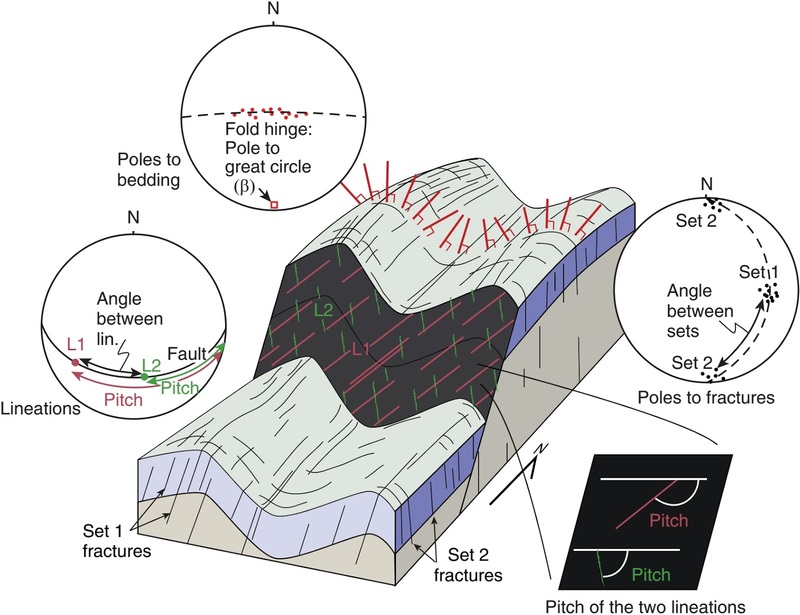 This is primary current lineation, also termed parting lineation because it occurs on bedding plane surfaces of sandstones that are flat bedded and usually readily split along bedding planes. An example is illustrated in Fig. 14. 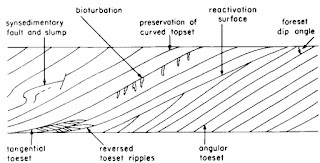 Primary current lineation is the product of a specific style of water turbulence above a bed of cohesionless grains, as are the various bedforms that give rise to crossbedding. It therefore has a specific hydrodynamic meaning and is useful in facies analysis as well as paleocurrent analysis. Rather than the bed itself, objects such as plant fragments, bones, or shells may be oriented on a bedding plane. A wide variety of erosional features is produced by water erosion of newly deposited sediment. These result from changes in water level or water energy in response to floods, storms, tides, or winddriven waves and currents. They can also result from evolutionary change in a system under steady equilibrium conditions. These processes result in the development of various types of bounding surfaces in the rocks. Recognition and plotting of these features in outcrop sections are important components of facies analysis, and with adequate exposure, orientation studies may contribute significantly to the analysis of depositional trends. These features range in size up to major river and tidal channels, submarine canyons, and distributary channels several kilometres across and tens or hundreds of meters deep, but large features such as this can rarely be detected in the average small outcrop. They may be visible in large outcrop sections, where they can be documented using lateral profiles and on seismic sections, and it may be possible to reconstruct them by careful lithostratigraphic correlation and facies analysis of scattered outcrops, but this is beyond the scope of our immediate discussion. At the outcrop scale, there are two types of small-scale erosional features to discuss, those that truncate one or more bedding units and those that scour or pit the bedding plane without significantly disrupting it. Fig. 15. Macroscopic erosional features. A. Abandoned fluvial channel showing levees and fine-grained fill, Carboniferous, Kentucky. B. Tidal channel filled with calcarenite, cut into finer grained tidal flat deposits, Carboniferous, Kentucky. C. A fluvial cutbank, Tertiary, Bylot Island, Arctic Canada. D. Close up of a stepped scour surface at the base of a fluvial channel, Permian, southern Poland. E. Intertidal carbonate mudflat deposits containing several scour surfaces covered by bioclastic debris (above) and a desiccated layer (below) showing incipient brecciation. Compare the latter with photo G. Silurian, Somerset Island, Arctic Canada. F. Discontinuity surface with manganiferous nodules and crusts, Lower Cretaceous, Provence, France. G. Intraformational breccia produced by breakup and reworking of a desiccated dolomite bed on a tidal flat. Ordovician, Somerset Island, Arctic Canada. H. Rill marks produced by water seepage from an exposed fluvial bar. Karoo Supergroup, Beaufort West, South Africa. I. Lowermost bed is a caliche formed by subaerial weathering of a shallow marine carbonate bed. It is followed by a coarse-grained lag deposit formed by a storm (center of view, below overhanging bed). Carboniferous, Kentucky. J. A caliche breccia, Cretaceous, Provence, France. K. A slide surface overlain by a large slumped mass of carbonate sediments. Cretaceous, Provence, France. The first type includes channels, scours, lowrelief erosion surfaces, and rill markings, in decreasing order of scale. Typical examples are illustrated in Fig. 15. These may be classified as macroscopic erosion features (Table 3). Channels and scours are usually filled by sediment that is distinctly different in grain size and bedding characteristics from that into which the channel is cut. Almost invariably the channel fill is coarser than the eroded strata indicating, as might be expected, that the generation of the channel was caused by a local increase in energy level. Figure 15A illustrates an exception to this, where a channel was abandoned and subsequently filled by fine sediment and coal under low-energy conditions. 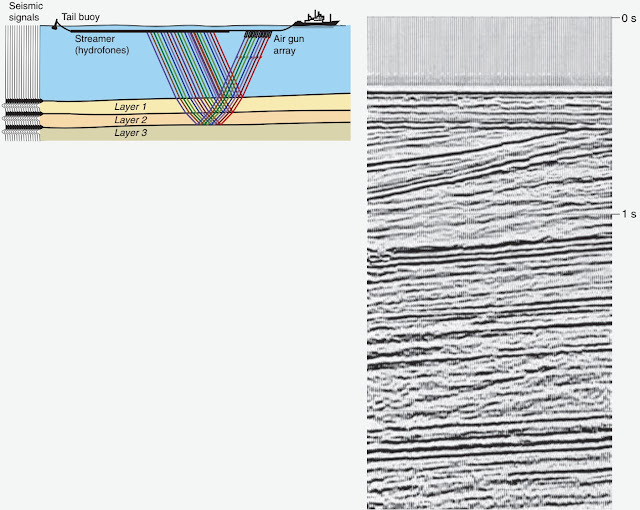 It is a common error to confuse trough crossbedding with channels. Troughs are formed by the migration of trains of dunes or sinuous-crested megaripples. They rest on curved scour surfaces, but these are not channels. The scours are formed by vortex erosion in front of the advancing dunes and are filled with sediment almost immediately. Channels, on the other hand, may not be filled with sediment for periods ranging from hours to thousands of years after the erosion surface is cut, and so the cutting and filling of the channel are quite separate events. Erosion surfaces may exhibit little erosional relief, which may belie their importance. In the nonmarine environment, sheet erosion, wind deflation, and pedimentation can generate virtually planar erosion sufaces. In subaqueous environments, oceanic currents in sediment-starved areas, particularly in abyssal depths, can have the same result. Exposed carbonate terrains may develop karst surfaces, with the formation of extensive cave systems. At the outcrop scale, careful examination of erosion surfaces may reveal a small-scale relief and the presence of features such as infilled desiccation cracks, basal intraformational or extrabasinal lag gravels (Fig. 15E), fissures filled with sediment from the overlying bed, zones of bioclastic debris, etc. In some subaerial environments, soil or weathering profiles may have developed, including the development of caliche or calcrete (Fig. 151 and J) and the presence of surfaces of nondeposition. In carbonate environments surfaces of nondeposition commonly develop subaqueously. Hardgrounds are organically bored surfaces that may be encrusted with fossils in growth positions. Alternatively, they may be discolored by oxidation, giving a red stain, or blackened by decayed algal matter. 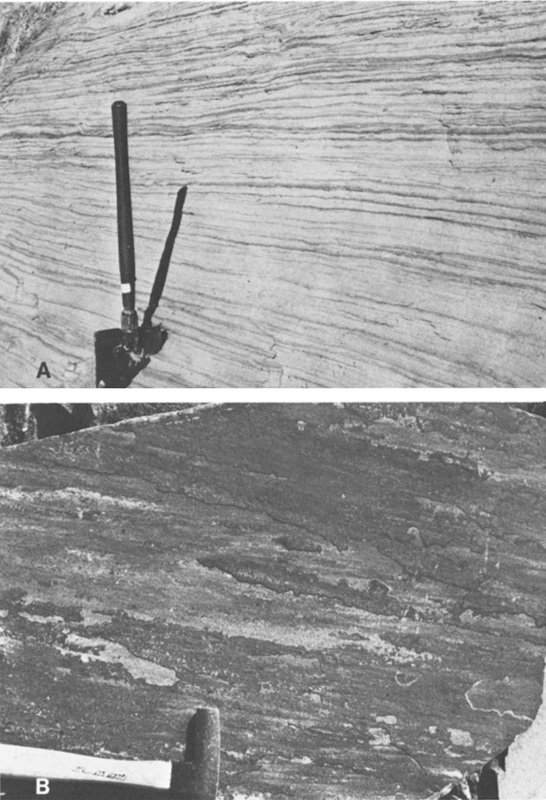 Long-continued winnowing of a surface of nondeposition may leave lag concentrates of larger particles, blackened by algal decay, and possibly including abundant phosphatized fossil material (Fig. 15F) (Wilson, 1975, p. 80-81). In continental-slope deposits, giant slumps and slides are common and are particularly well exposed as intraformational truncation surfaces in deep water carbonate sediments. An example is illustrated in Fig. 15K. It may be difficult to assess the length of time missing at erosion surfaces-some may even represent major time breaks detectable by biostratigraphic zonation. In any case, a careful search for and description of such features in the field is an important part of section description. Mesoscopic erosional features fall mainly into a class of structure termed sole markings. These are features seen on the underside of bedding planes, usually in sandstones, and they represent the natural casts of erosional features cut into the bed below, which is typically siltstone or mudstone. They attest to the erosive power of the depositional event that formed the sandstone bed, but, beyond this, most have little facies or environmental significance. However, they can be invaluable paleocurrent indicators. Fig. 16. Sole markings A. Flute markings. Note vortex flow lines on large flute near center of view. Cretaceous, Provence,France. B. Tool markings, mainly groove casts and load casts. Cretaceous, Provence, France. Flute markings are formed by vortex erosion, typically at the base of turbidity currents. Erosion is deepest at the up-current end of the scour and decreases down current, so that in a flute cast the high-relief nose of the cast points up current. In rare examples, vortex flow lines may be perceived in the walls of the flute (Fig. 16A). Flutes generally are in the order of a few centimeters deep. Tool markings are a class of sole structure formed by erosional impact of large objects entrained in the flow, including pebbles, plant fragments, bone, or shell material. The many varieties that have been observed have been assigned names that indicate the interpreted mode of origin. They include groove, drag, bounce, prod, skip, brush, and roll markings. A few examples are illustrated in Fig. 16B, which show the strongly linear pattern on the bed, providing excellent paleocurrent indicators. Clay deposits saturated with water are characterized by a property termed thixotropy: when subjected to a sudden vibration, such as that generated by an earthquake, they tend to liquify and loose all internal strength. This behavior is responsible for generating a variety of structures in clastic rocks. Clay beds commonly are interbedded with sand or silt and, when liquified, the coarser beds have a higher density than the clay and tend to founder under gravity. This mayor may not result in the disruption of the sand units. Where complete disruption does not take place, the sand forms bulbous shapes projecting into the underlying clay, termed load structures. These are usually best seen in ancient rocks by examining the underside of a sandstone bed (Fig. 15B). They are therefore a class of sole structure, though one produced without current movement. Clay wisps squeezed up between the load masses form pointed shapes termed flame structures because of a resemblance to the shape of flames. These are best seen in cross section. Occasionally, loading may take place under a moving current, such as a turbidity flow, and load structures may then be stretched, possibly by shear effects, into linear shapes paralleling the direction of movement. Fig. 17. Sedimentary structures produced by liquefaction. load or fluid loss. A. Dish structures in a grain flow deposit. Cretaceous, Provence, France. B. Pipe structure produced by penecontemporaneous vertical water escape in a fluvial sandstone, Devonian, northeast Scotland. C. A set of small water escape pipes in a lacustrine sandstone. Devonian, northeast Scotland. D. Small sand volcano created by water escape at the depositional surface, Eocene, Banks Island, Arctic Canada. E. A clastic dyke filled with sandstone and conglomerate. Huronian (Proterozoic), Espanola, Ontario. F. Desiccation cracks in a lacustrine deposit, Devonian, northeast Scotland. G. Synaeresis markings. Silurian, Somerset Island, Arctic Canada. H. Ball and pillow structures in a turbidite unit, Cretaceous, Provence, France. (. Penecontemporaneous slump produced by failure on a delta front slope, Eocene, Banks Island, Arctic Canada. J. Load and drape structures caused by presence of massive crinoidallimestone in thin bedded limestones and mudstones. Devonian, Princess Royal Islands, Arctic Canada. K. Overturned crossbedding caused by fluid shear of a saturated sandstone. Proterozoic, Banks Island, Arctic Canada. L. Ice crystal casts in a fluvial floodplain pond. Karoo Supergroup, Beaufort West, South Africa. Commonly, load masses become completely disrupted. The sand bed may break up into a series of ovate or spheroidal masses that sink into the underlying bed and become surrounded by mud. Lamination in the sand is usually preserved in the form of concave-up folds truncated at the sides or tops of each sand mass, attesting to the fragmentation and sinking of the original layer. Various names have been given to these features, including ball, pillow, or pseudonodule structures (Fig. 17H). These structures rarely have a preferred shape or orientation and are not to be confused with slump structures, which are produced primarily by lateral rather than vertical movement. In many environments, sediment is deposited on a sloping rather than a flat surface (largescale examples of this are visible on seismic reflection surveys and are called clinoformssee), for example, the subaqueous front of a delta, which is something like a very large-scale foreset built into a standing body of water. The difference is that once deposited such material usually does not move again as individual grains because the angle of the slope is too low. Typically, large-scale submarine fans and deltas exhibit slopes of less than 2°. However, the sediment in such environments is water saturated and has little cohesive strength. Slopes may therefore become oversteepened, and masses of material may be induced to slump and slide downslope by shock-induced failure. Undoubtedly, the thixotropic effects described previously facilitate this process. The result is the production of internal shear or glide surfaces and deformed masses of sediment, termed slump structures. Failure surfaces may be preserved as syndepositional faults. Small-scale examples of these features are commonly seen in outcrops, as illustrated in Figs. 171 and J. 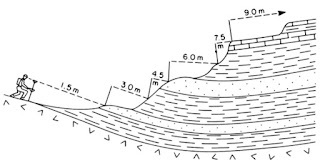 Some examples of convolute bedding may be produced this way, although others are the result of water escape, as discussed below. Structures produced by failure and lateral movement commonly retain an internal orientation with a simple geometric relationship to the orientation of the depositional slope. This could include the elongation of slump masses and the orientation (strike) of slide surfaces, both parallel to depositional strike, or the asymmetry, even overturning, of folds in convolute beds. Recognition of these geometric properties in an outcrop is important because it helps distinguish the structures from those of different origin, and orientation characteristics obviously have potential as paleo slope indicators. Deformed or overturned crossbedding (Fig. 17K) is developed in saturated sand beds by the shearing action of water or turbid flow across the top of the bedform. The upper few centimeters of the crossbedded unit move down current by a process of intragranular shear, and fore set lamination is overturned as a result, producing an up-current dip. Obviously, to produce this structure, the shearing current must have a similar orientation to that of the current that generated the crossbedding. Deformed crossbedding is common in fluvial and deltaic environments. As additional sediment is laid on top of saturated deposits, grains within the substrate begin to settle and pack more tightly. Pore waters are expelled in this process and move upward or laterally to regions of lower hydrostatic pressure. Eventually, they may escape to the surface. This process may take place slowly if sediment is being deposited grain by grain and the fluid movement leaves little or no impression on the sediments. However, if loading is rapid, a much more energetic process of fluid loss takes place, and the sediment itself will be moved around in the process. The result, in sand-grade deposits, is a group of features called dish and pillar structures (Fig. 17A). Dishes are produced by escaping water breaking upward through a lamination and turning up the edges; pillars record the vertical path of water flow moving to the surface. Dishes may be up to 50 em in diameter. These structures are particularly common in the deposits of sediment gravity flows, such as fluidized flows, in which sediment emplacement is rapid. They are produced by water escape as a flow ceases movementthe loss of the lubricating effect of water itself being one of the main reasons why the flow stops. However, dish and pillar structures have also been observed in fluvial and other deposits and are therefore not environmentally diagnostic. Obviously, they can only be seen in deposits containing lamination and will not be present if the sand is uniform in texture. Fluid movement within a bed is an additional cause of convolute lamination. In this case, the laminations are folded by internal shear and may occasionally be broken through by pipes (Fig. 17B,C). At the sediment-water interface, escaping water may bubble out as a small spring, building up a miniature sand volcano (Fig. 17D). The emplacement of relatively more dense material over a lower density layer was discussed previously as the cause of load casts. In addition to the downward movement of the denser material, this situation can be the cause of upward movement of lighter sediment, which is injected, together with contained pore fluids, into the overlying rocks. This can occur on a large scale, producing diapirs of evaporite or mud, both of which flow readily under the overburden weight of a few hundred meters of sediment. These diapirs may be several kilometers across and may extend up for several kilometers through overlying deposits. Evaporite diapirs commonly develop on continental margins. Mud diapirs are a characteristic feature of deltas, where coarser deltaic sediment is dumped rapidly on marine mud deposits. 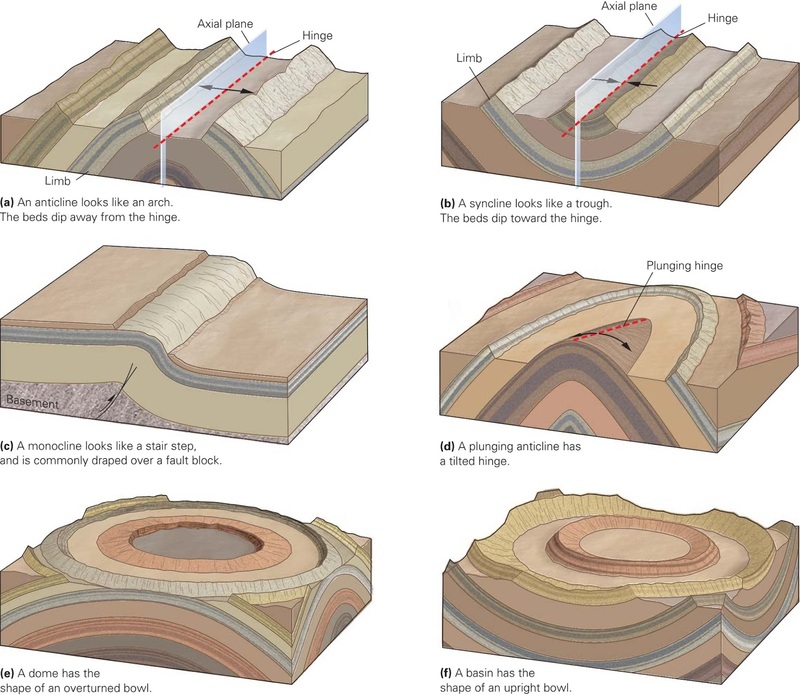 On a smaller scale, the same injection process can generate clastic dykes, consisting of sheets of sandstone or conglomerate (siliciclastic or carbonate) cutting through overlying or underlying beds (Fig. 17E). The host rocks usually are sharply truncated and not internally deformed, indicating that they were at least partially lithified prior to intrusion. Some dykes intrude along fault planes. Some are intensely folded, suggesting deformation by compaction and further dewatering after injection. Desiccation cracks are readily recognized by even the untrained eye (Fig. 17F). They are one of the best and most common indicators of subaerial exposure in the rock record. They may penetrate as deep as a few meters into the underlying rocks (although a few centimeters is more typical) and are normally filled by sediment from the overlying bed. Teepee structures are a variety of large desiccation cracks caused by limestone or evaporite expansion on tidal flats. Desiccated beds on tidal flats may peel or curl as they dry, and disrupted fragments commonly are redeposited nearby as an intraclast breccia (Fig. 15G). A subtly different kind of shrinkage feature, termed a synaeresis structure, has been recognized in recent years (Fig. 17G; Donovan and Foster, 1972). These are formed by volume changes in response to salinity variations in the ambient waters and superficially resemble desiccation cracks. They may be distinguished by two principal differences: unlike desiccation cracks, they do not normally form continuous polygonal networks across bedding planes, but may appear as a loose assemblage of small worm-like relief markings on a bedding surface; second, they do not show deep penetration into the substrate, but appear to rest on the bedding plane in which they are found. Synaeresis structures are formed subaqueously and are common in such environments as lakes, lagoons, and tidal pools, where salinity changes may be frequent. Evaporation and freezing may cause the development of crystals of evaporite salts and water, respectively, on the depositional surface, particularly on alluvial floodplains, supratidal flats, and lake margins. Evaporite crystals and nodules may be preserved in the rock record and, of course, major evaporite deposits are common; but individual crystals commonly are replaced by pseudomorphs, or are dissolved and the cavity filled with silt or sand, forming a crystal cast. Such structures are a useful indicator of subaerial exposure and desiccation, but do not necessarily imply long-term aridity. Gypsum and halite are the two commonest minerals to leave such traces. Gypsum forms bladeshaped casts and halite characteristic cubic or "hopper-shaped" structures. Ice casts may be formed in soft sediments during periods of freezing, but have a low preservation potential (Fig.17L). Particularly distinctive evaporite structures on supratidal (sabkha) flats are termed ptygmatic, enterolithic, and chicken-wire structures. These are caused by in-place crystal growth, expansion, and consequent compression of evaporite nodules, possibly aided by slight overburden pressures. The enterolithic structure is so named for a resemblance to intestines; the chicken-wire structure is caused by squeezing of carbonate films between the nodules; ptygmatic folds may be caused largely by overburden pressures (Maiklem et al., 1969). Last, gas bnbble escape structures should be mentioned. These are produced by carbon dioxide, hydrogen sulphide, or methane escaping from buried, decaying organic matter. Gas passes up through wet, unconsolidated sediment and forms bubbles at the sediment-water interface, leaving small pits on the bedding surface. These structures have been confused with rain imprints, but form subaqueously, as may be apparent from associated features preserved in the rocks. True rain imprints probably are very rare. Body fossils are obviously among the most powerful environmental indicators to be found in sedimentary rocks and should be observed and identified with care. Paleontology and paleoecology are specialized subjects, a detailed discussion of which is beyond the scope of this book. However, those engaged in describing outcrop sections for basin-analysis purposes should be able to make use of such information as they can gather. A complete and thorough paleontological-paleoecological examination of an outcrop section may take several hours, days, or even weeks of work, involving the systematic examination of loose talus and breaking open fresh material or sieving unconsolidated sediment in the search for a complete suite of fossil types. Extensive suites of palynomorphs or microfossils may be extracted by laboratory processing of field samples. Many apparently unfossiliferous or sparsely fossiliferous stratigraphic intervals have been found to contain a rich and varied fauna or flora by work of this kind, but it is the kind of research for which few basin analysts have the time or inclination. Weare concerned in this book with reconstructing depositional environments and paleogeography. Fossils can be preserved in three different ways that yield useful environmental information. Fig. 18. In-place fossils (life assemblages). A. Biostrome containing Disphyllid and Thamnopora corals, Devonian, northern Spain. B. Coral biostrome, Devonian, near Norman Wells, N. W.T., Canada. C. Typical reef facies. Boundstone composed of calcisponges and encrusting stromatolites, Capitan reef, Permian, Guadalupe Mountains, Texas. D. Tree in growth position, Pennsylvanian, Kentucky. 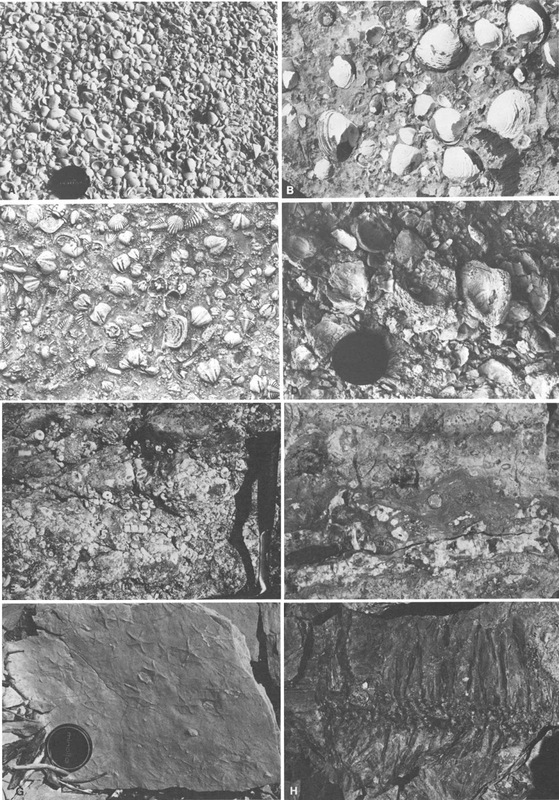 E. Domal stromatolites, bedding plane exposure, Proterozoic, Dismal Lakes, N .W.T., Canada. F. Domal stromatolites capped by finger stromatolites, Silurian, Somerset Island, N.W.T., Canada, (photos A and C courtesy of B. Pratt). Fig 19. Preservation of delicate structures, including soft parts. A-D are from the Middle Cambrian Burgess Shale, Yoho National Park, British Columbia; E-F are from the Upper Jurassic Solnhofen Limestone, Bayern, Germany. Bar scales are all 5 mm in length. A. Vauxia gracilenta, Walcott, a sponge. B. Burgessochaeta setigera (Walcott), a polychaete worm. C. MarreLla splendens Walcott, an arthropod. D. Canadaspis perfecta (Walcott), a crustacean; E. Antrimpos speciosus Munster, a shrimp. F. Aeschnogomphus intermedius, a dragonfly. All photos courtesy of D. Rudkin and the Royal Ontario Museum. Fig. 20. Fossil assemblages. All but H are death assemblages. A. Modern shell beach, Sanibel Island, Florida. B. Pelecypods in shallow-marine sandstone, Cretaceous, Banks Island, N.W.T., Canada. C. Trilobites and brachiopods on a bedding plane, Silurian, southern Ontario. D. Oyster beach deposit, Pleistocene, Mallorca. E. Crinoidal reef debris·, Devonian, Princess Royal island, N.W.T., Canada. F. Brachiopods, corals, ostracodes and other bioclastic debris in vertical section, Devonian lagoonal limestone, southern Ontario. G. Starfish in shallow marine sandstones of the Molasse Marine, Miocene, near Digne, France. H. Plant fragments are typically preserved as fragments in a death assemblage, but this is an exception. 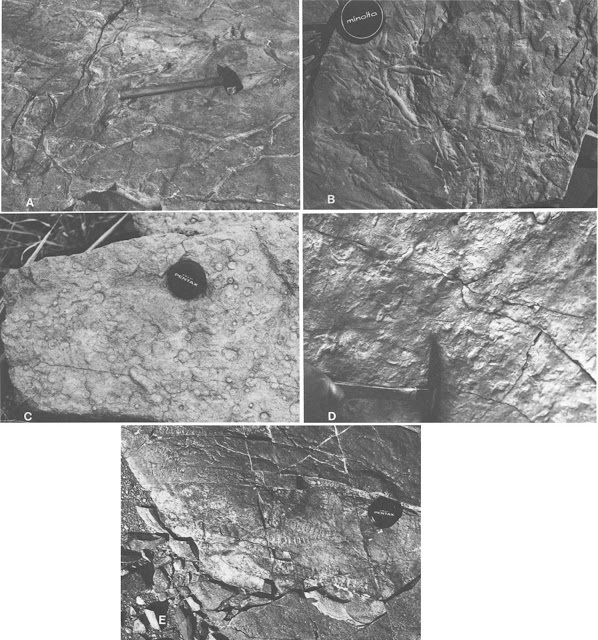 The photograph shows in-place rootlets of Stigmaria sp., Pennsylvanian, Kentucky. (photo C courtesy of R. Ludvigsen; photos D, F courtesy of B. Pratt). In-place life assemblages include invertebrate forms attached to the sea bottom, such as corals, archaeocyathids, rudists, some brachiopods and pelecypods in growth positions, some bryozoa, stromatoporoids, stromatolites, and trees. In-place preservation usually is easy to recognize by the upright position ofthe fossil and presence of roots, if originally part of the organism. This type of preservation is the easiest to interpret because it permits the drawing of close analogies with similar modern forms, in the knowledge that the fauna or flora almost certainly is an accurate indicator of the environment in which the rocks now enclosing it were formed. Examples are illustrated in Fig. 18. Environmental indicators almost as good as in-place life assemblages are examples of soft-bodied or delicately articulated body fossils preserved intact (Fig. 19). These indicate very little transport or agitation after death and preservation in quiet waters, such as shallow lakes, lagoons, abandoned river channels, or deep oceans. The Cambrian Burgess Shale in the Rocky Mountains near Field, British Columbia, contains one of the most famous examples of such a fossil assemblage, including impressions of soft, nonskeletal parts of many organisms, such as sponges, that are not found anywhere else. The Jurassic Solnhofen Limestone of Germany is another good example. The bones of vertebrate animals tend to disarticulate after death because of the decay of muscle and cartilage and the destructive effects of predators. Nevertheless, entire skeletons of bony fish, reptiles, and mammals are commonly found in certain rock units, indicating rapid burial under quiet conditions. The Solnhofen Limestone is a wellknown example, containing, among other fossils, the entire skeleton and feather impressions of a primitive bird. Such fossil assemblages must, nevertheless, be interpreted with care because a limited amount of transportation is possible from the life environment to the site of eventual burial. Presumably the bird of the Solnhofen Limestone lived in the air, not at the sediment-water interface where it was deposited! Much more common than either of the foregoing are death assemblages of fossils that may have been transported a significant distance, perhaps many miles from their life environment. These commonly occur as lag concentrates of shelly debris such as gastropod, pelecypod, brachiopod, or trilobite fragments and fish bones or scales (Fig. 20). Such concentrations may be abundant enough to be locally rock forming, for example, the famous Silurian Ludlow Bone Bed of the Welsh borderlands. They normally indicate a channel-floor lag concentration or the product of wave winnowing and can usually be readily recognized by the fact that fragment grain size tends to be relatively uniform. Transported body fossils may not occur as concentrations but as scattered, individual occurrences, in which case each find must be interpreted with care. Did it live where it is now found or was it transported a significnt distance following death? The environmental deduction resulting from such an analysis may be quite different depending on which interpretation is chosen. Evidence of transportation may be obvious and should be sought; for example, broken or abraded fossils may have traveled significant distances. Overturned corals, rolled stromatolites (including oncolites), and uprooted tree trunks, are all obviously transported. These problems are particularly acute in the case of microfossils and palynomorphs that, on account of their size, are particularly susceptible to being transported long distances from their life environment. 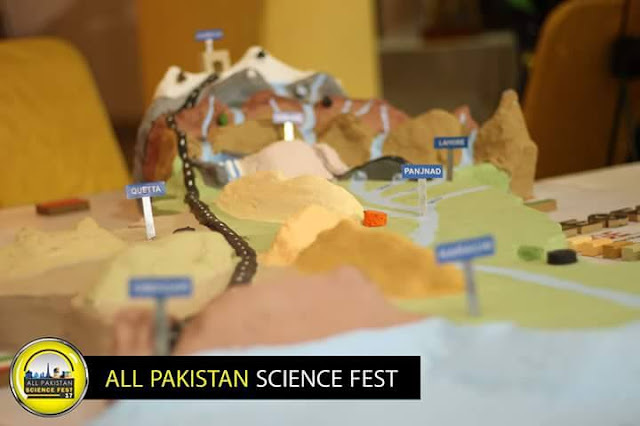 For example, modern foraminiferal tests are blown tens of kilometers across the supratidal desert flats of India and Arabia, and shallow water marine forms are commonly carried into the deep sea by sediment gravity flows, such as turbidity currents. Environmental interpretations based on such fossil types may therefore be very difficult, though it may still be possible if the analysis is carried out in conjunction with the examination of other sedimentary features. 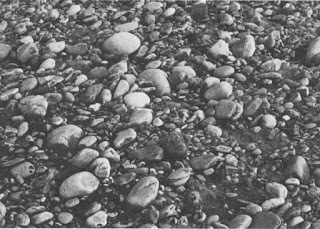 In fact, it was the occurrence of sandstones containing shallowwater foraminifera interbedded with mudstones containing deep-water forms in the Cenozoic of the Ventura Basin, California, that was one of the principal clues leading to the development of the turbidity current theory for the origin of deep water sandstones. Fig. 21. Trace fossils as exposed on bedding plane surfaces. A. Interconnected burrows in Ordovician limestone, Ottawa. B. Short burrows in Ordovician sandstone, Boothia Peninsula, Arctic Canada. 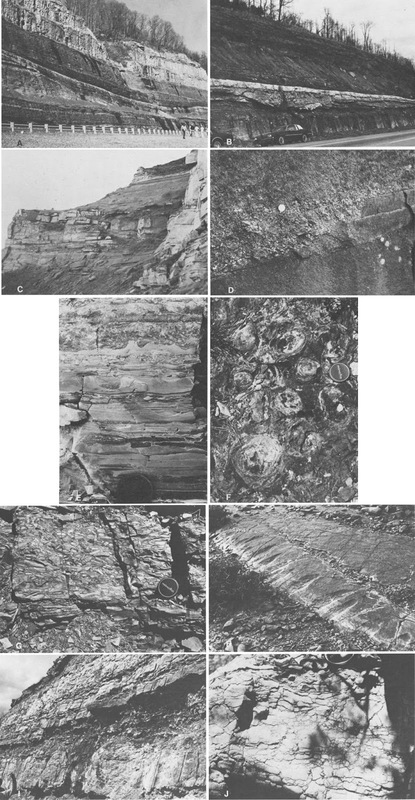 C. Cross sections of vertical, tubular Skolithus burrows, Karoo Supergroup, near Durban, South Africa (see Fig. 22A). D. Casts of bird footprints, Cretaceous flysch, Provence, France. E. Markings of a resting or swimming crustacean, Karoo Supergroup, Beaufort West, South Africa. Fig. 22. Trace fossils as exposed in cross-section. A. Skolithus, Karoo Supergroup, near Durban, South Africa (see Fig. 21C). B. Dipiocraterion, Cretaceous, Provence, France. C. Sloping lungfish burrows, Devonian, northeast Scotland. D. Mottling produced by bioturbation in a dolomite, plus individual small burrows. Ordovician, Boothia Peninsula, Arctic Canada. Footprints, burrows, resting, crawling, or grazing trails, and escape burrows are abundant in some rock units, particularly shallow marine deposits; all may yield useful environmental information, including water depth, rate of sedimentation, and degree of agitation. Even the nondescript structure "bioturbation," which is ubiquitous in many shallow marine rocks, can be interpreted usefully by the sedimentologist. Footprints are, of course, best seen on bedding plane surfaces, as are many types of feeding trails and crawling traces (Fig. 21). Burrows are better examined in vertical cross section and are most visible either in very clean, fresh, wetted rock surfaces or in wind- or wateretched weathered outcrops (Fig. 22). Stromatolites are a distinctive component of many carbonate successions, particularly those of Precambrian age and have been the subject of much detailed study. Table 4. 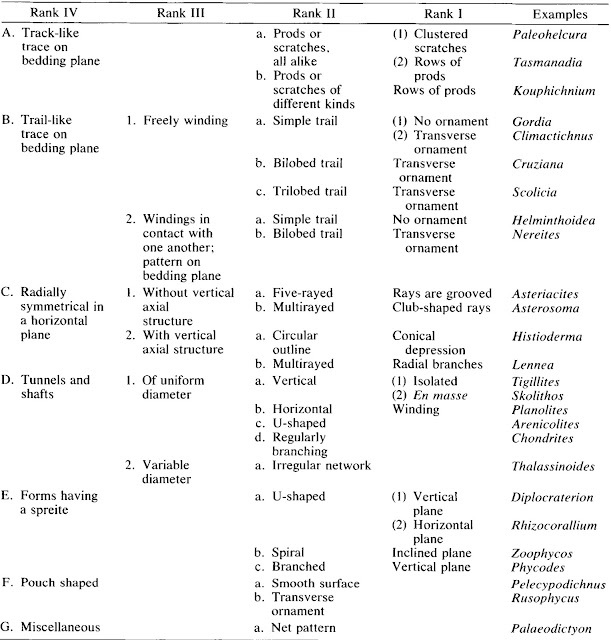 Classification of trace fossils. Information to record on trace fossils includes morphology, size, attitude, abundance, internal structures, and lithofacies associations. Farrow (1975) provided a useful review of field and laboratory techniques for studying trace fossils. 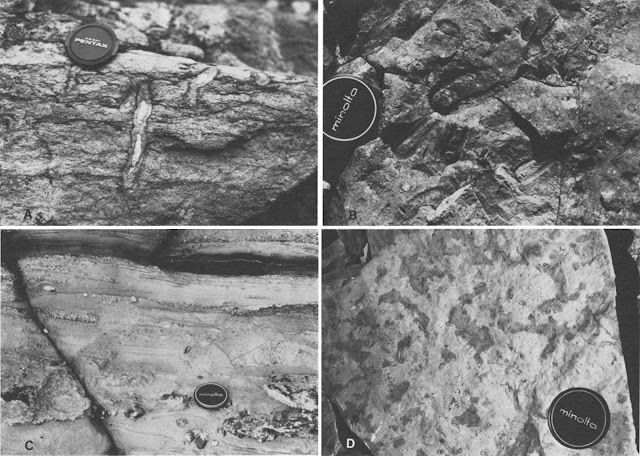 Table 4 is a classification of some common invertebrate trace fossils.